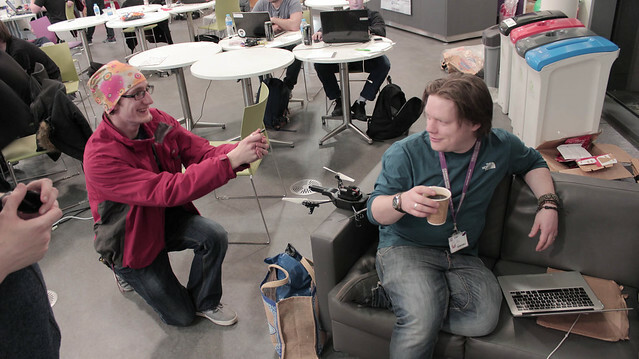 Following on from my previous two posts, this one captures most of the Hackathon’s essence played out on Twitter. 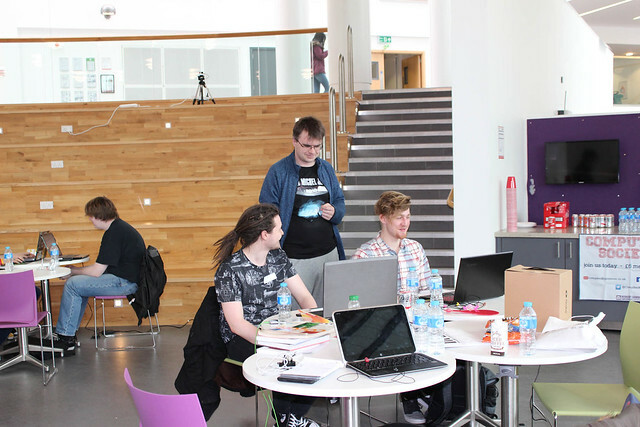 A few of the tweets may not be in chronological order as the tweets below are a collective from searches, hastags and @RGUHack tweets. 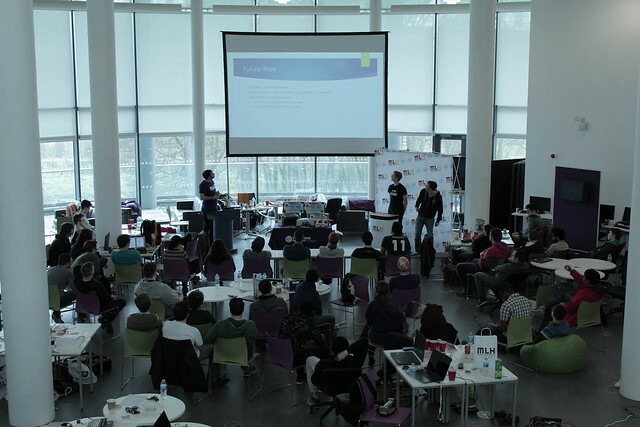 Long weekend @RGUHack over, great to see all the effort put in by all our @RGUComputing students. 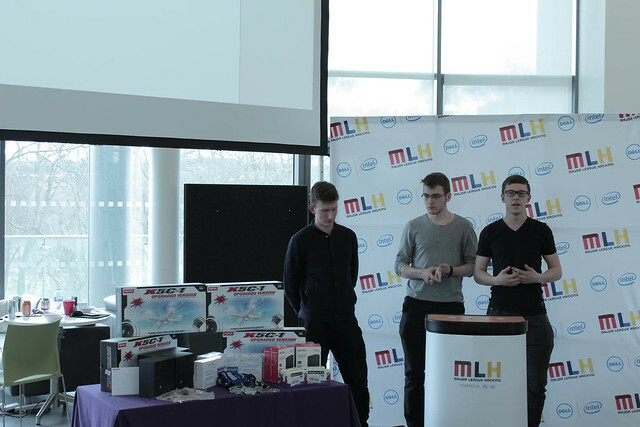 You do us proud. 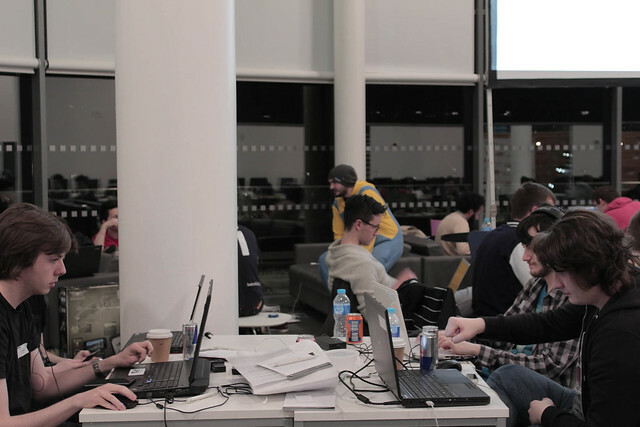 Shoutout to the #hackers at @codefestinfo @copenhacks @rguhack & #ninjahackscy! 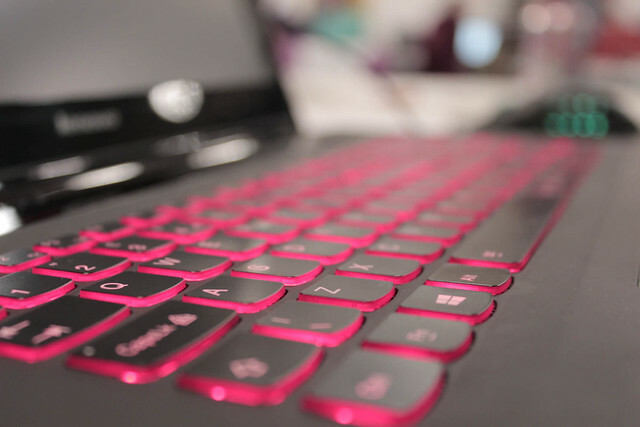 Get your free #domain at https://t.co/Nn19qLjTZh. 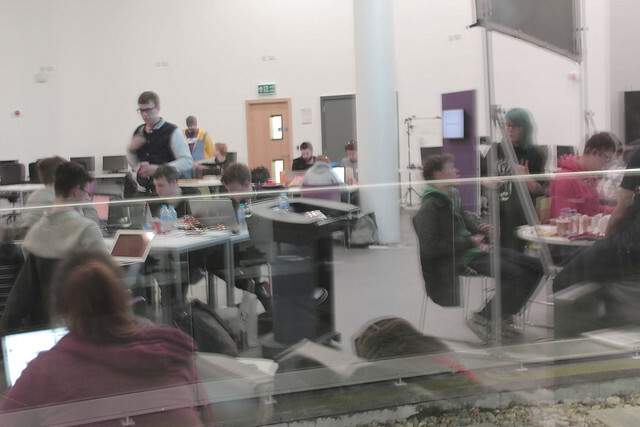 Already a few hour in for a cracking hackathon at #RGUHack. 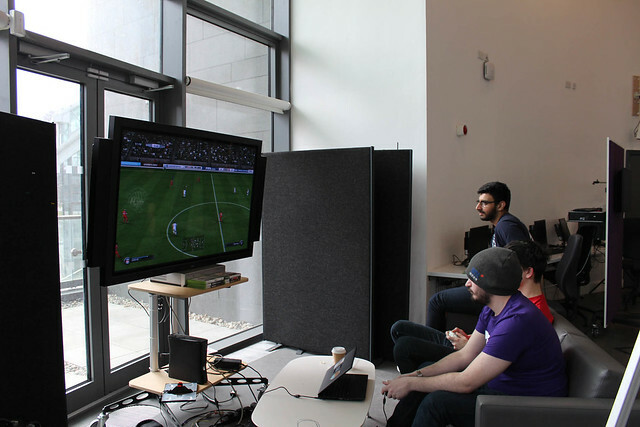 The teams are all quiet while we are too busy playing fifa. 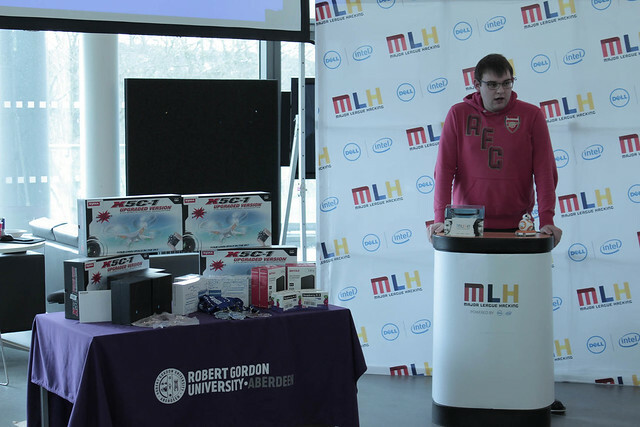 @RGUHack @RGUComputing We can't wait! 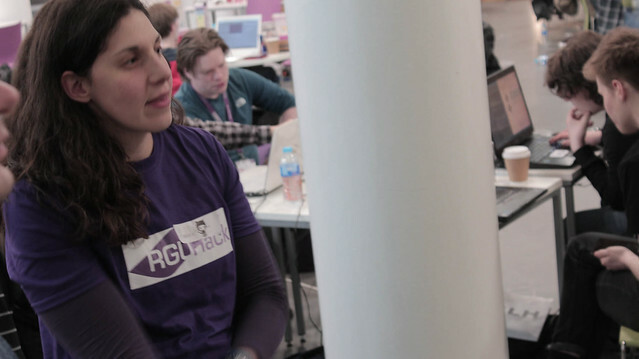 Excited because I'm going to be in Aarhus, Denmark 🇩🇰 for AUHack and Aberdeen, Scotland 🇬🇧 for RGUHack next month! 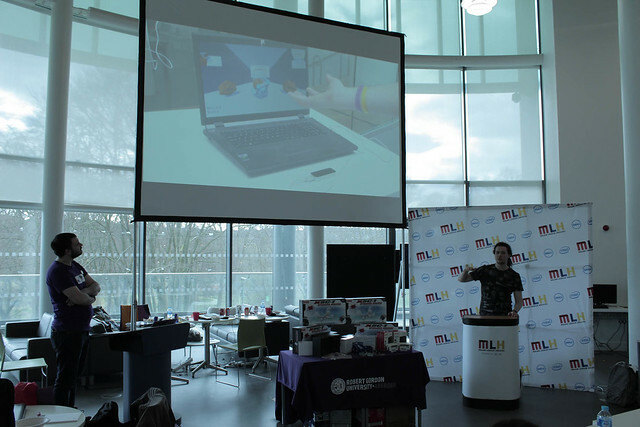 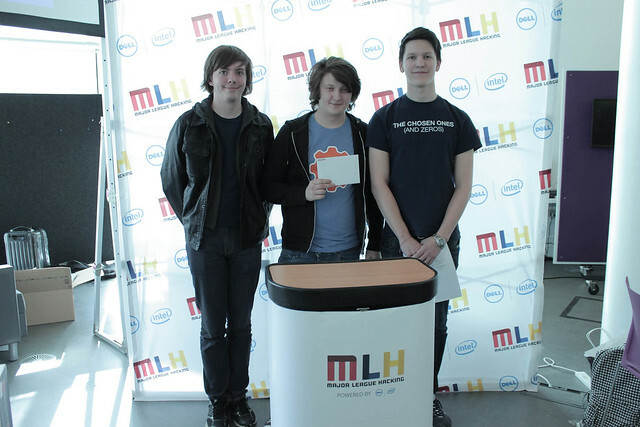 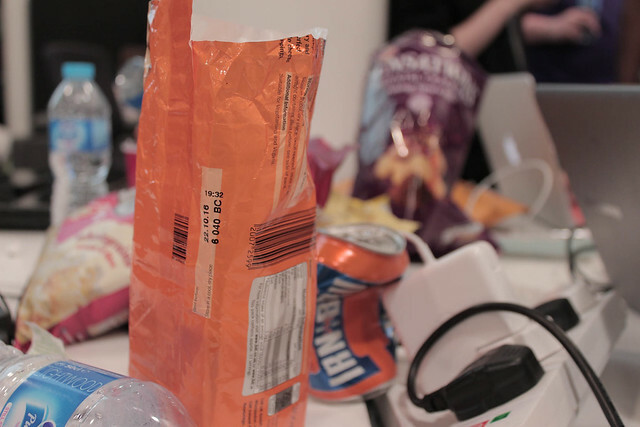 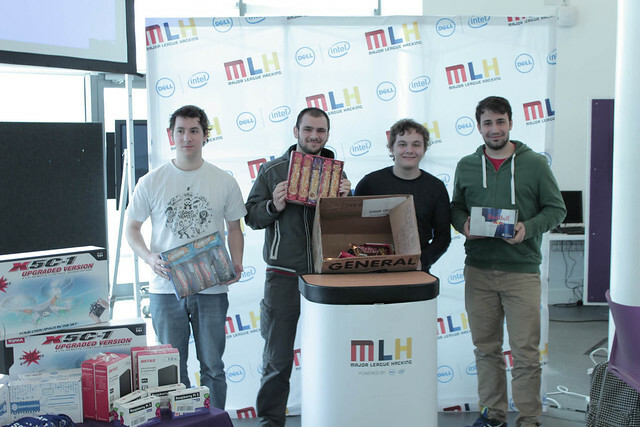 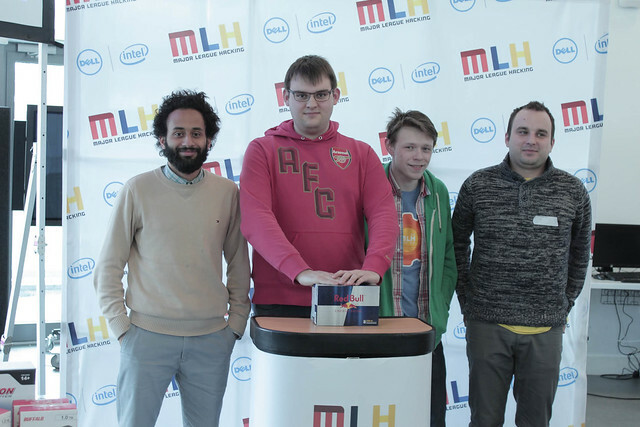 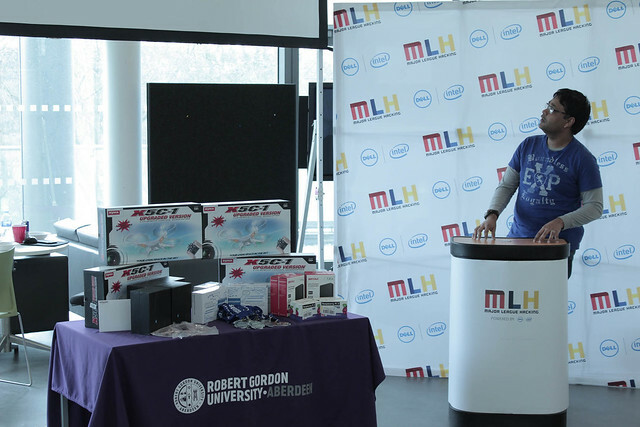 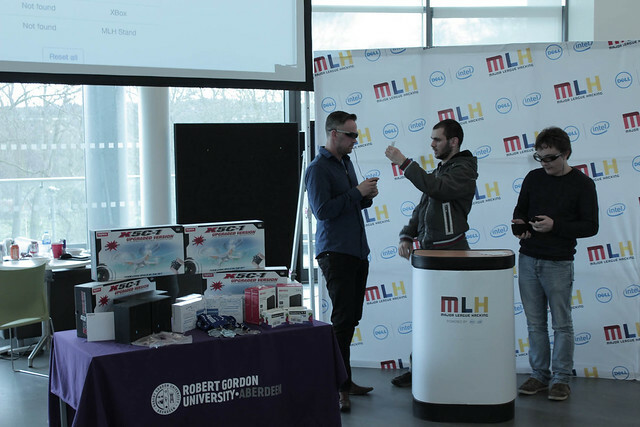 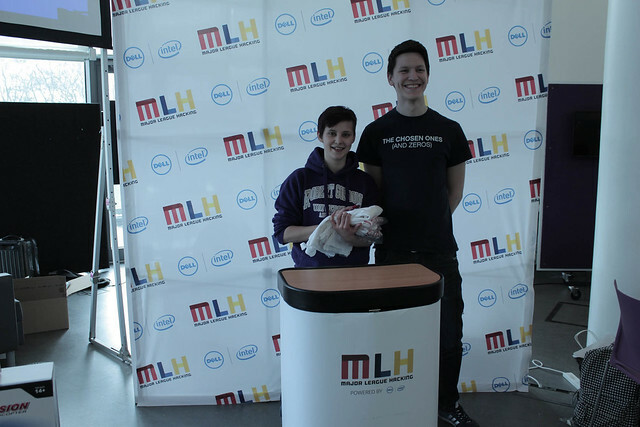 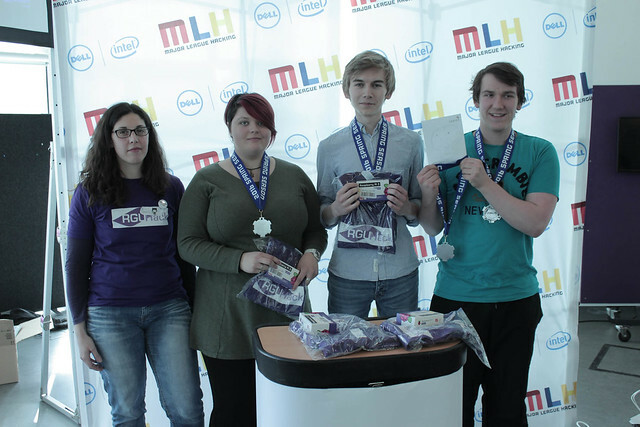 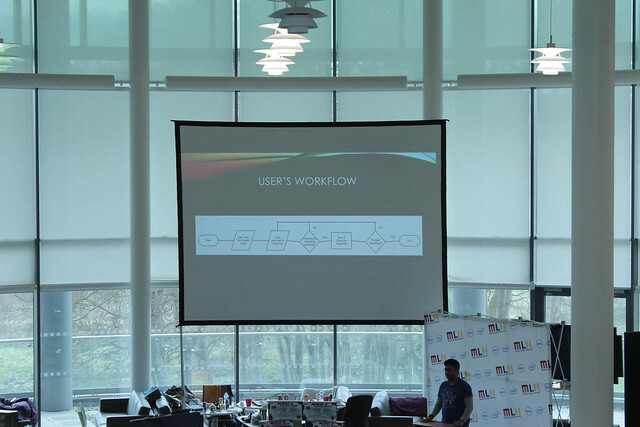 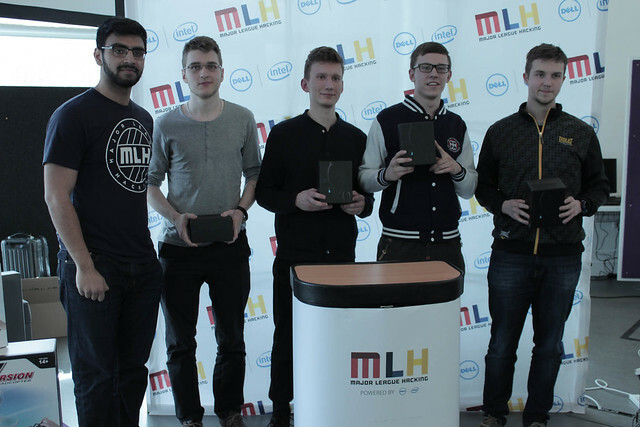 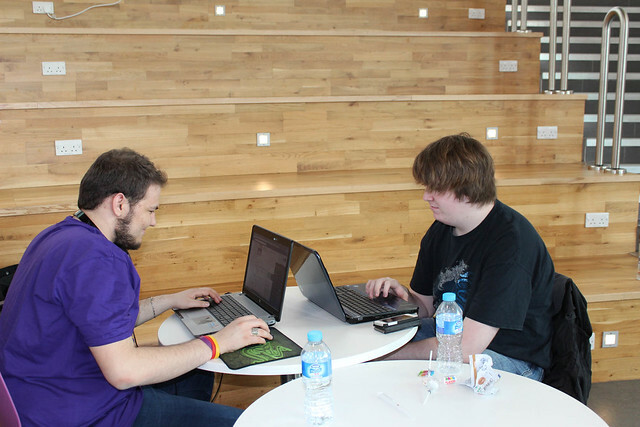 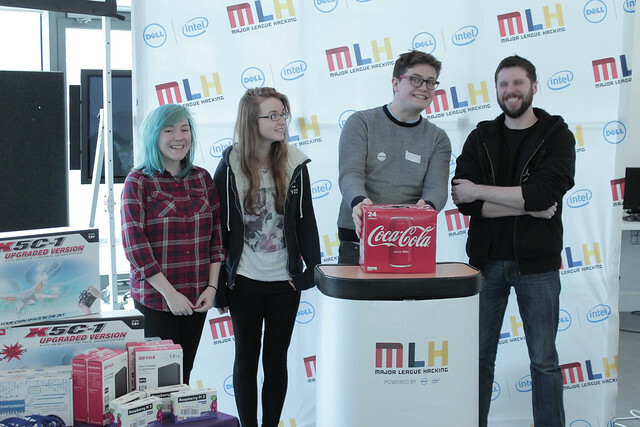 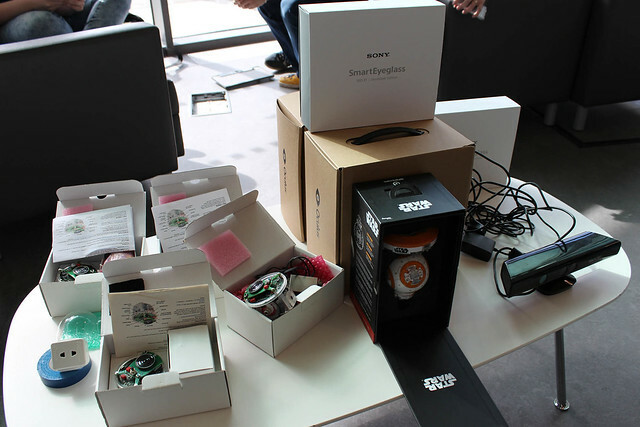 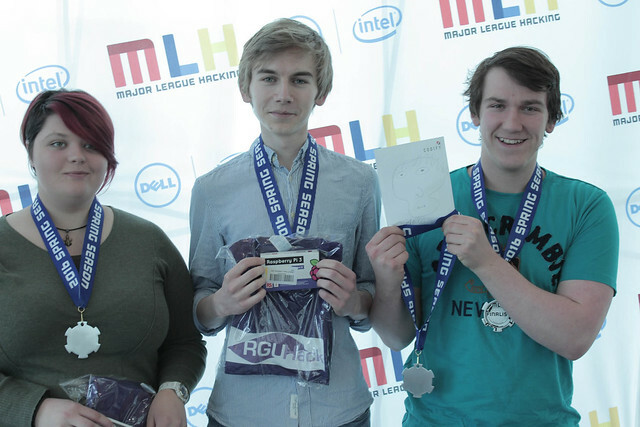 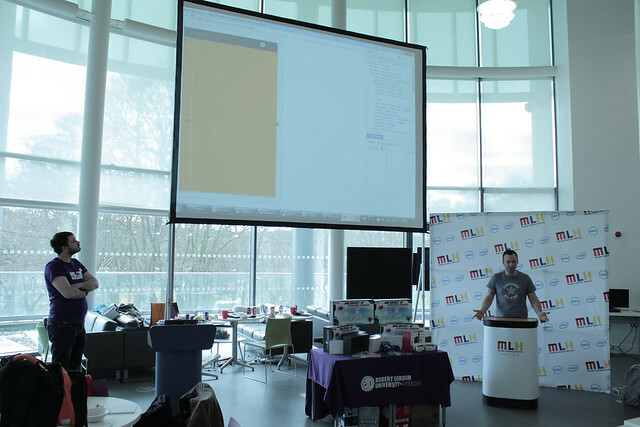 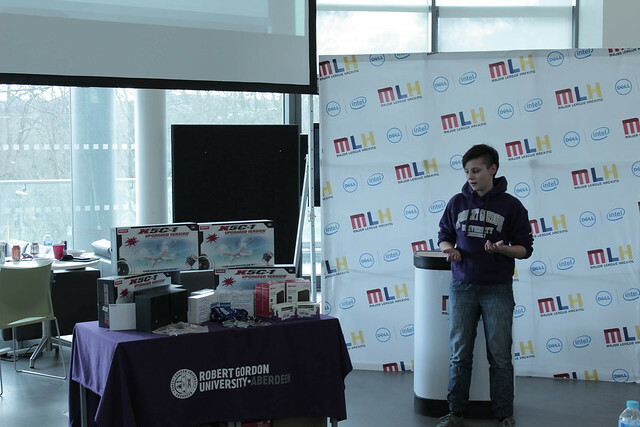 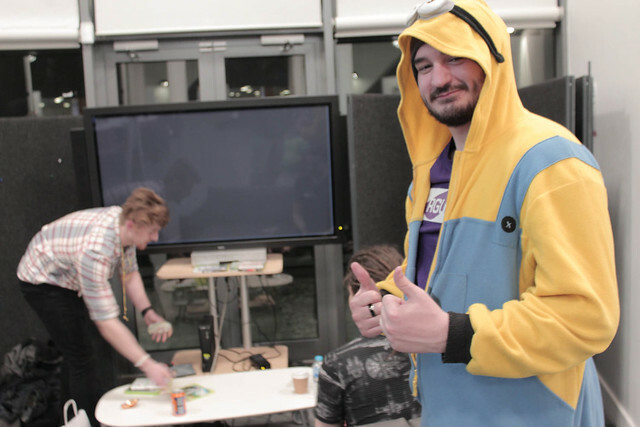 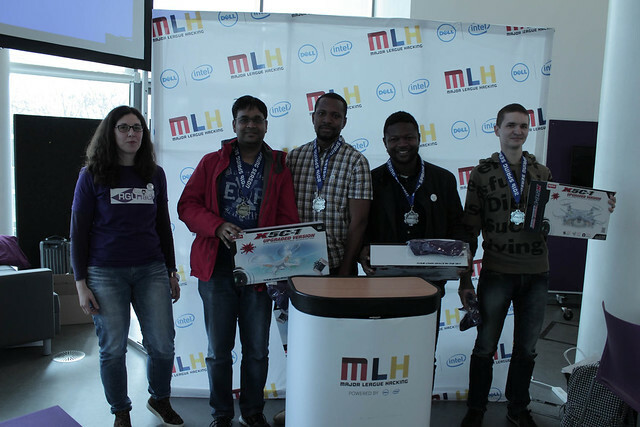 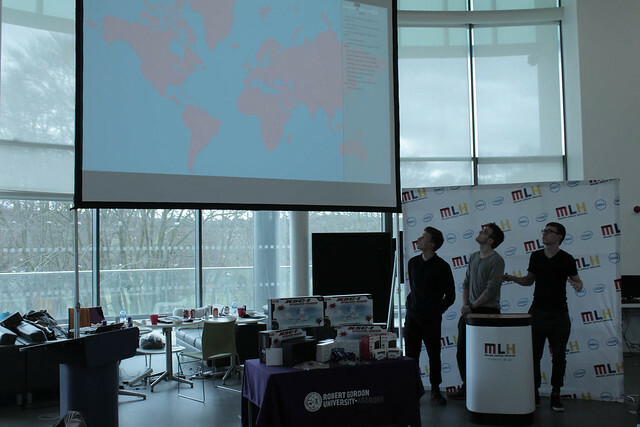 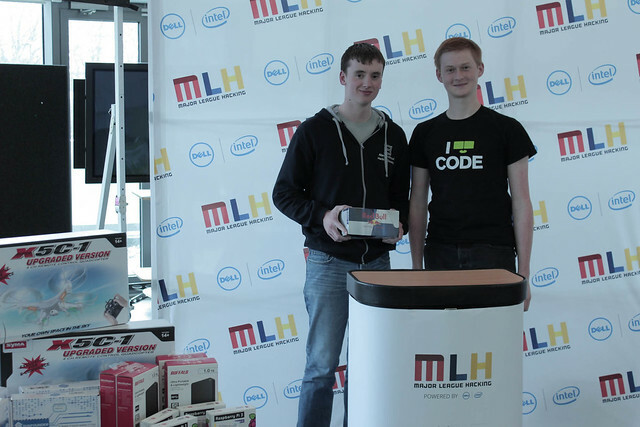 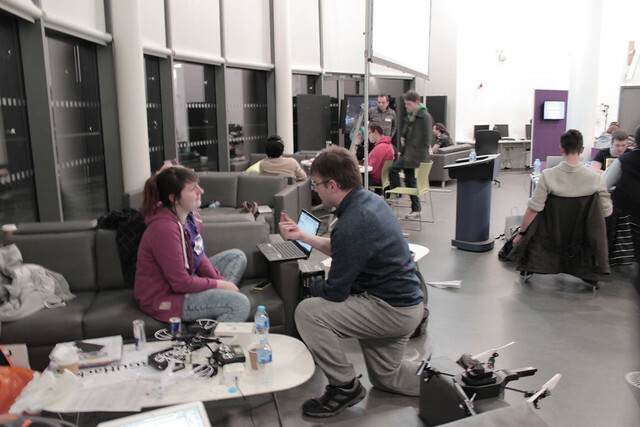 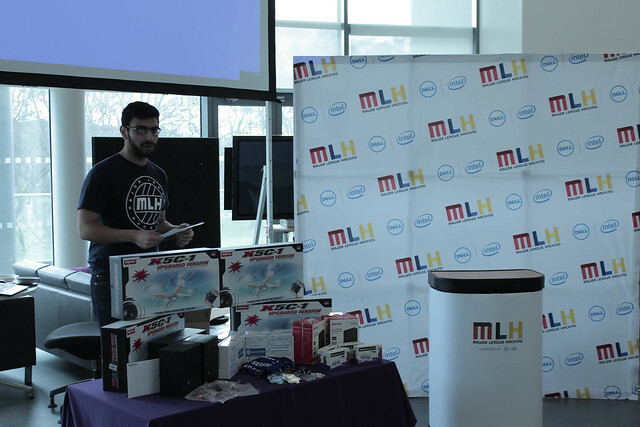 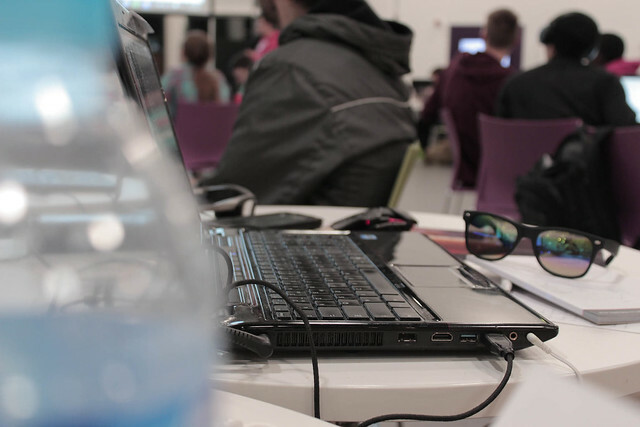 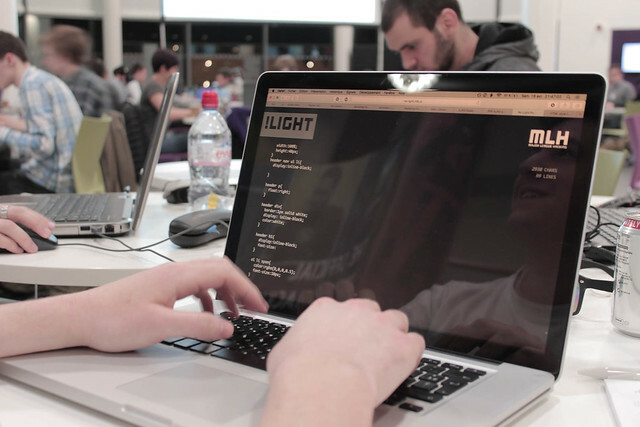 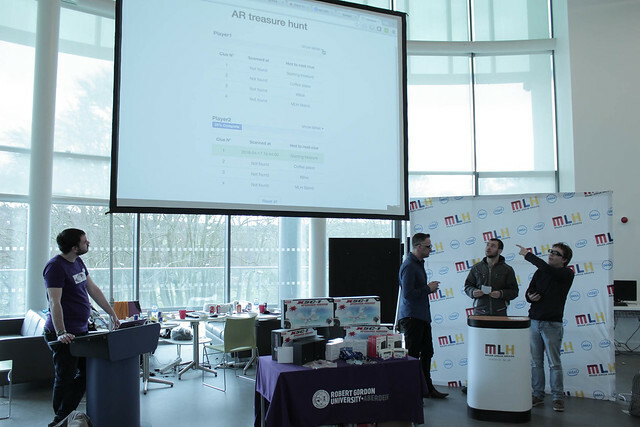 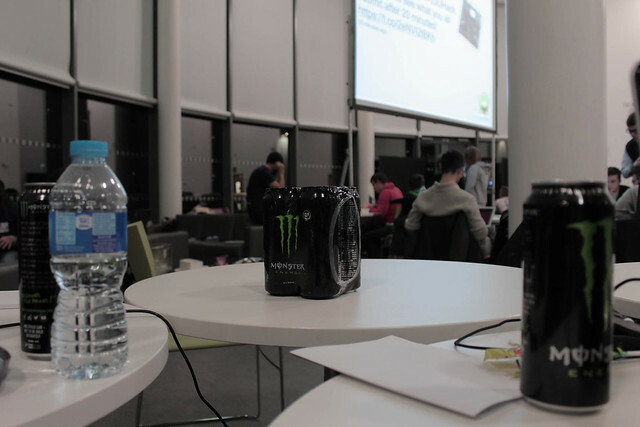 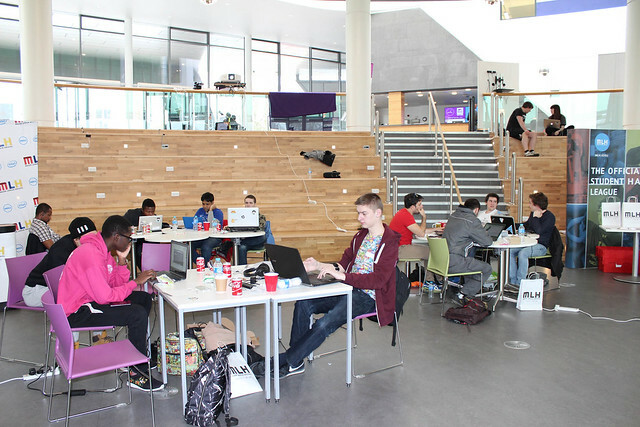 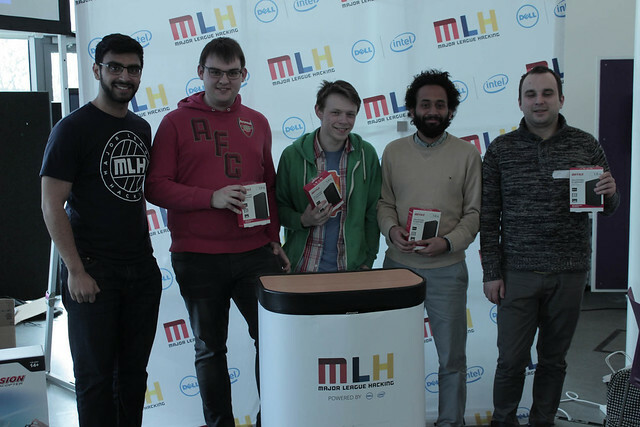 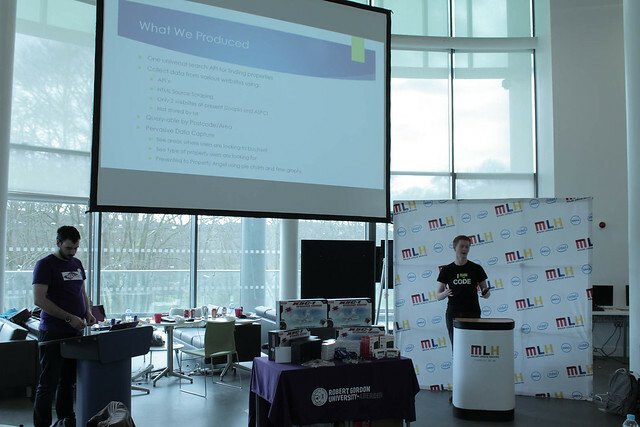 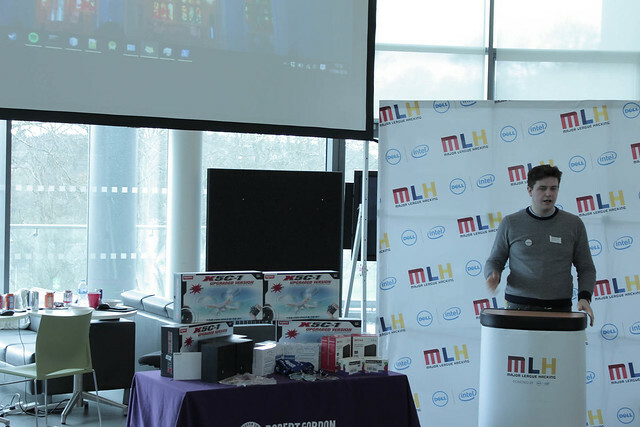 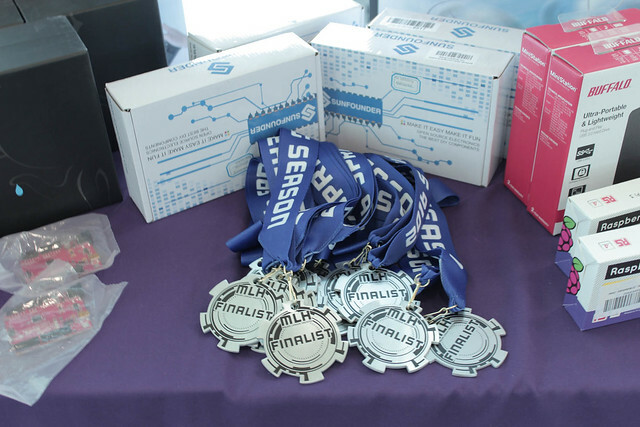 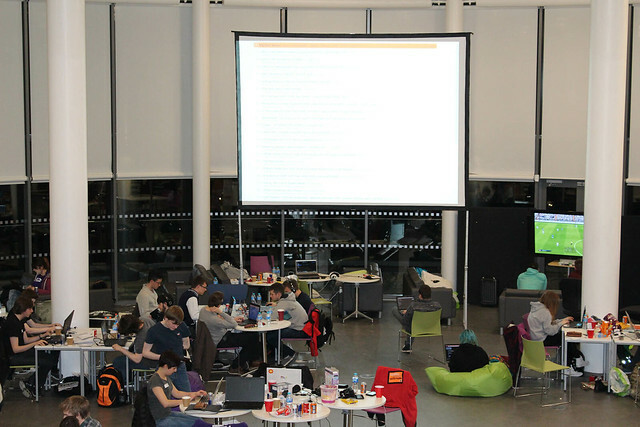 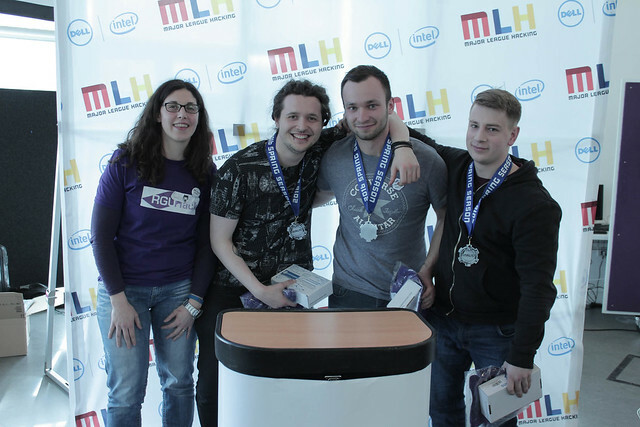 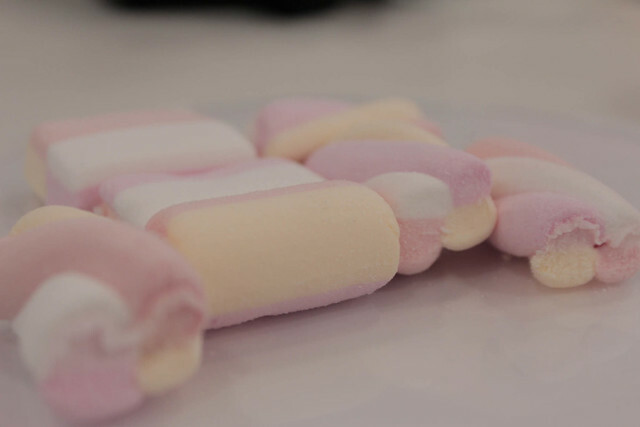 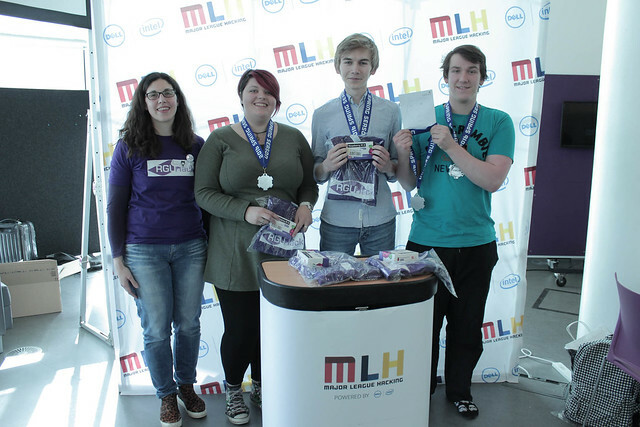 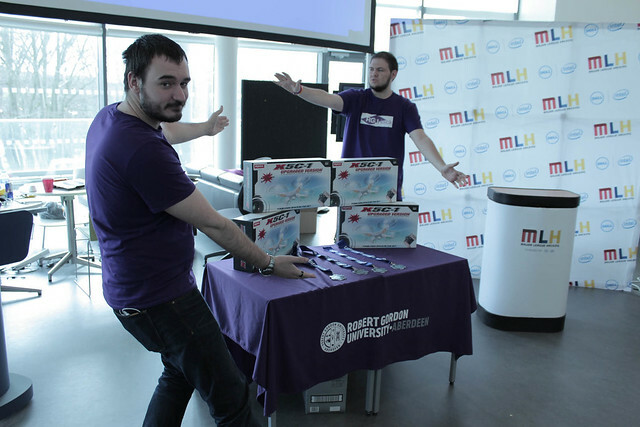 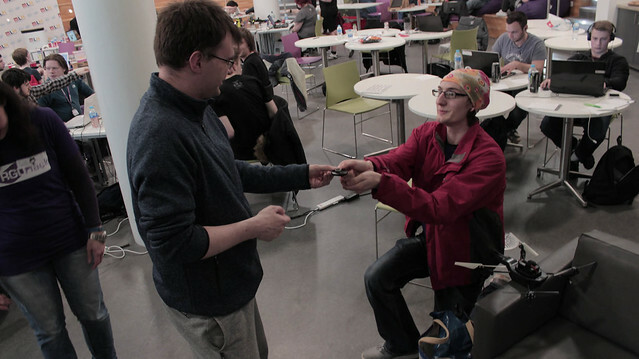 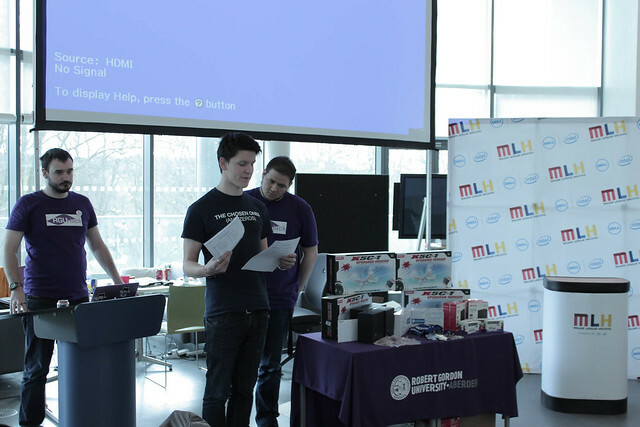 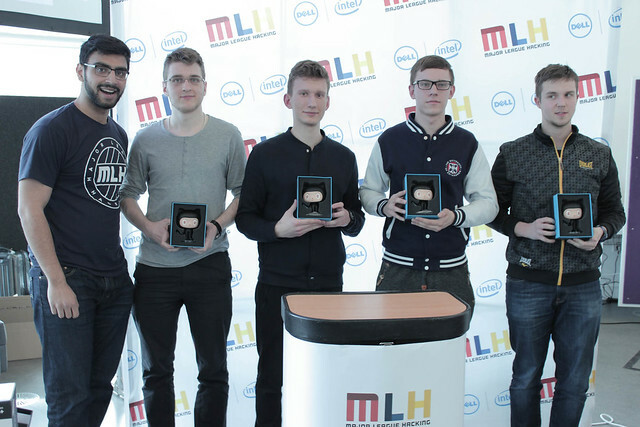 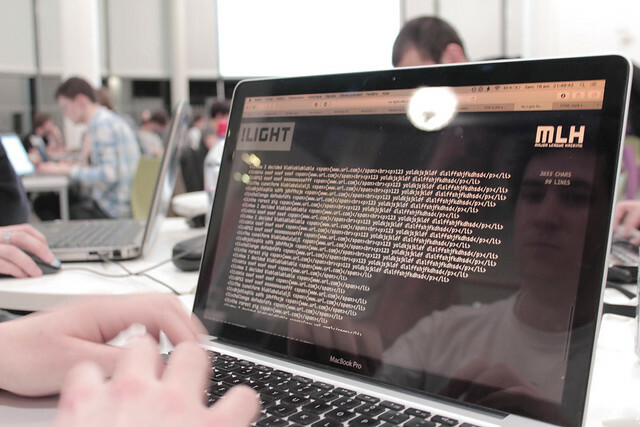 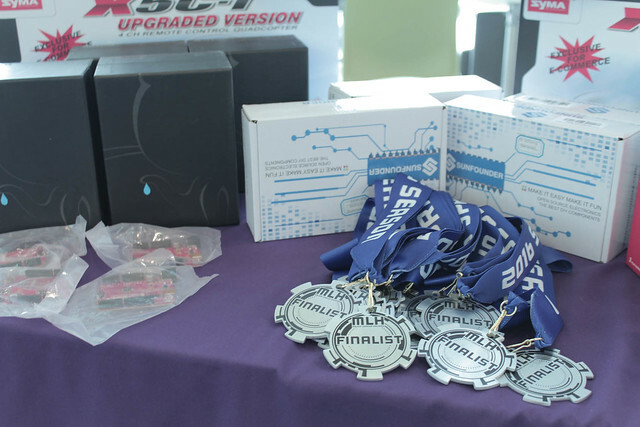 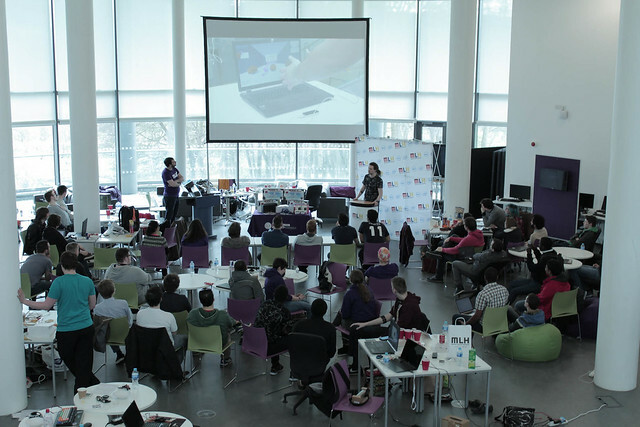 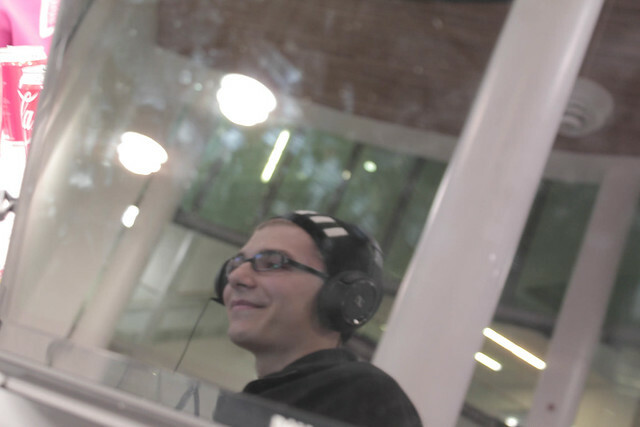 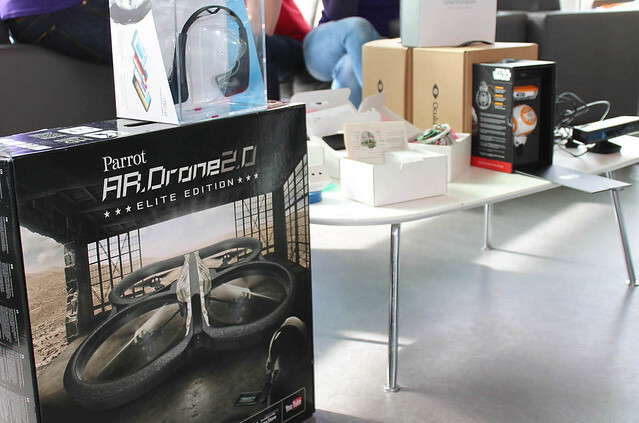 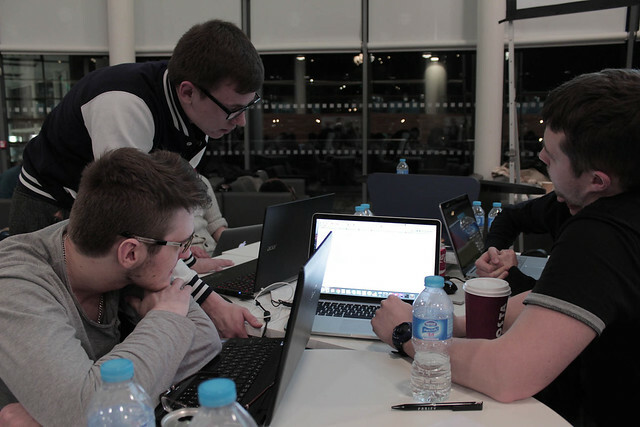 Following on from my previous post highlighting events of the RGUHack 2.0 Hackathon (Online). 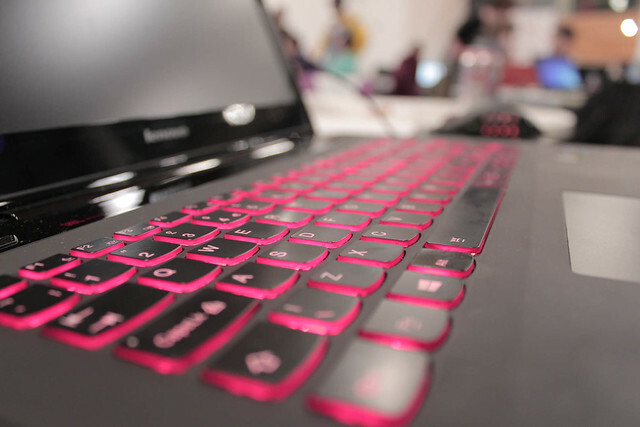 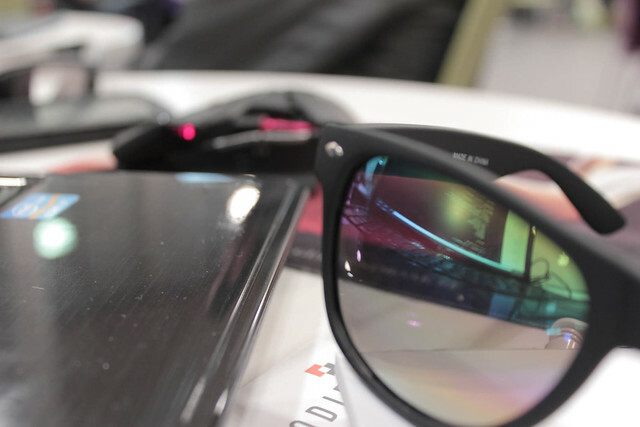 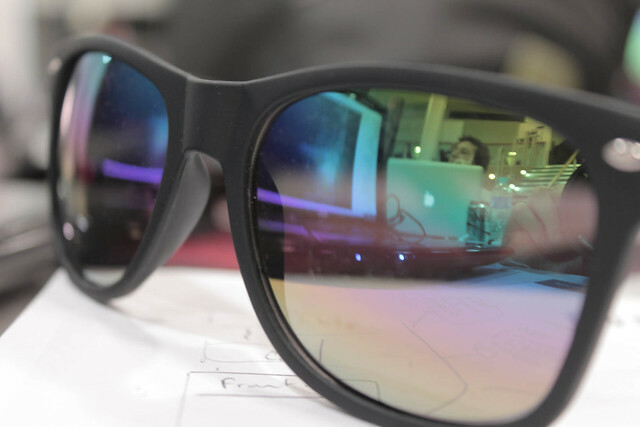 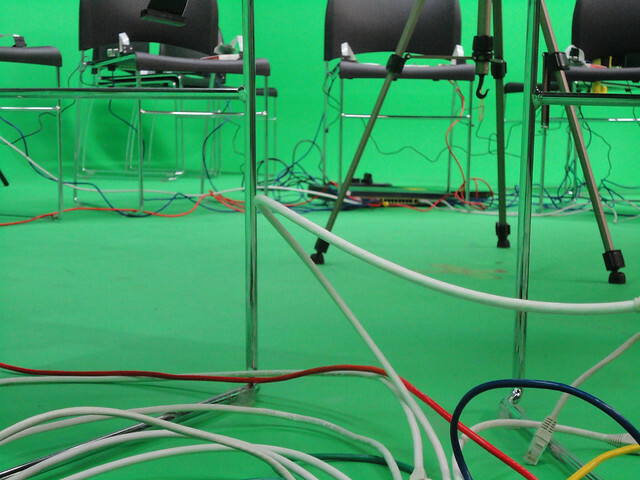 This post focuses on some elements of video captured during the event. 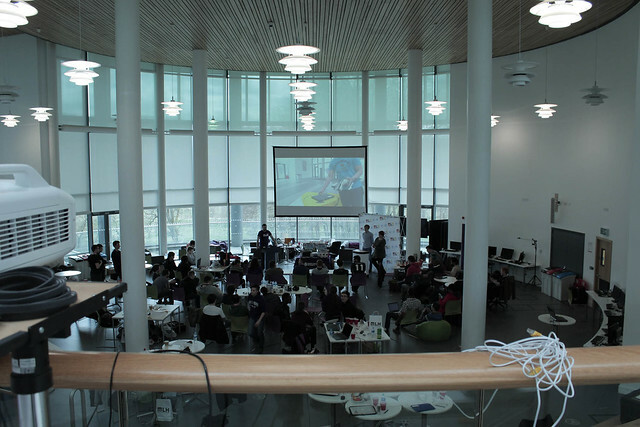 First up is a time-lapse of the 24 hour hackathon, this is followed by some interesting apps that are controlled by a Leap Motion. 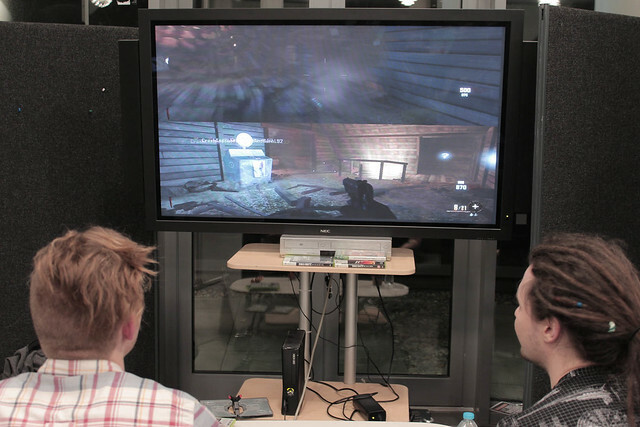 A Youtube playlist of these videos may be found (Online). 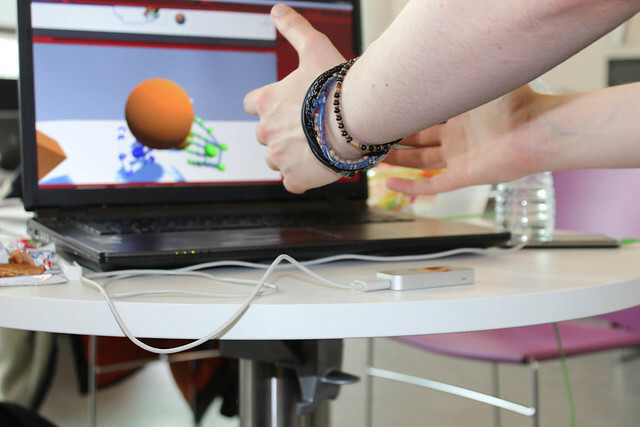 The first of these is a game of basketball, as you can see it takes a bit of practice to get the hang of it, however it makes for a really interesting way of interacting with a 3D environment and is really fun to play. 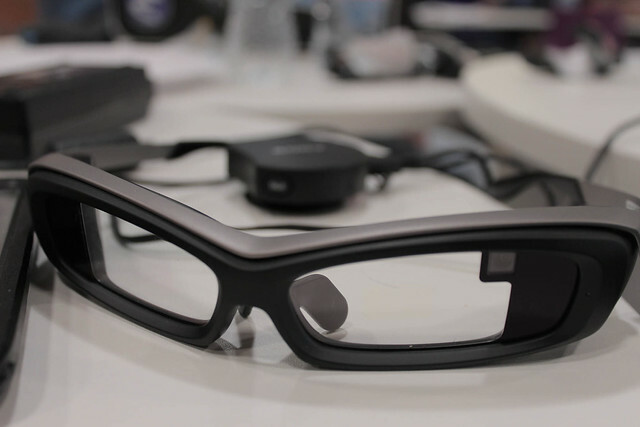 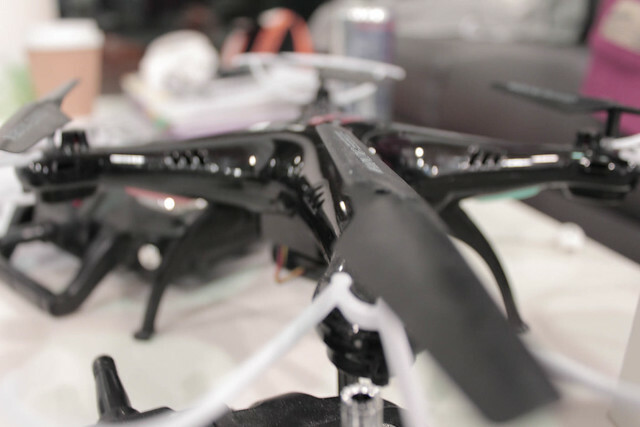 The other videos available below show the use of a Leap Motion to control the flight of an AR Parrot 2.0 Drone. 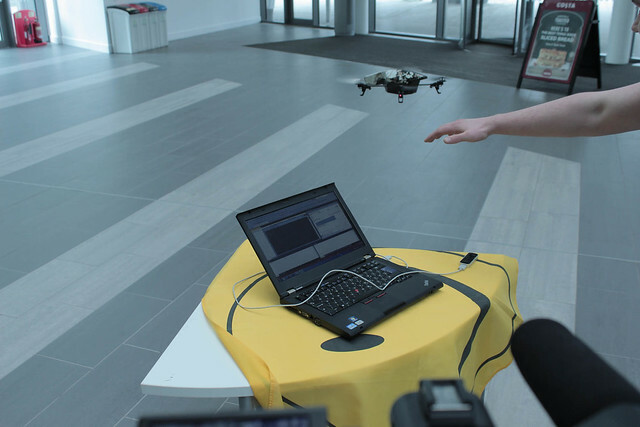 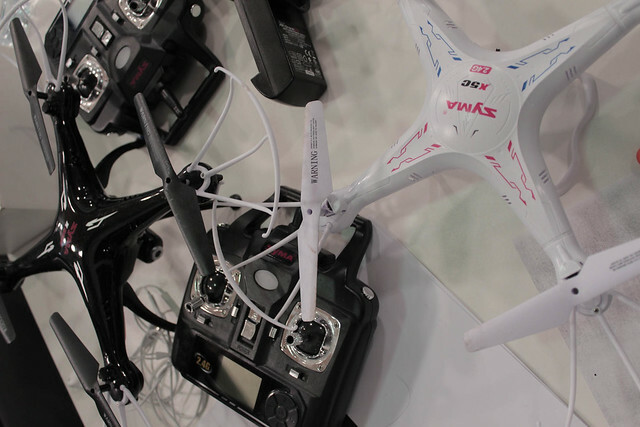 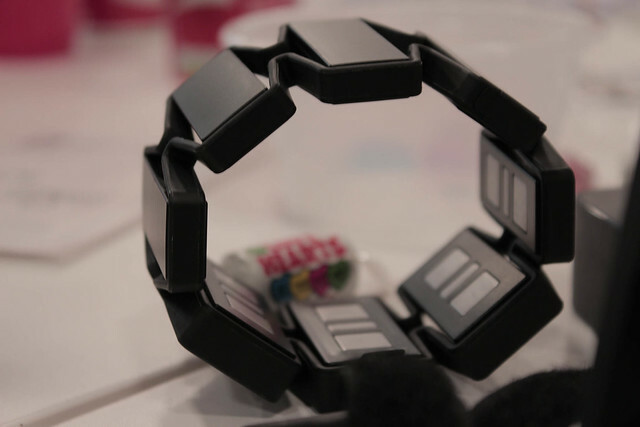 Its is quite responsive and is easily controlled, – closing your hand will start it up, while raising or lowering your hand will have a corresponding effect on the drone as you could expect. 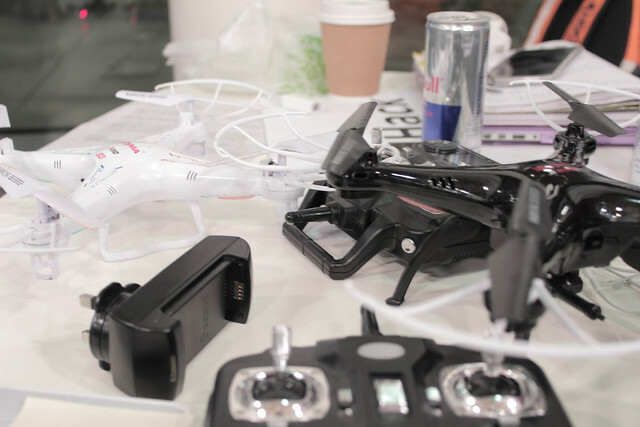 Tilting your hand will result in the drone moving forward / back. 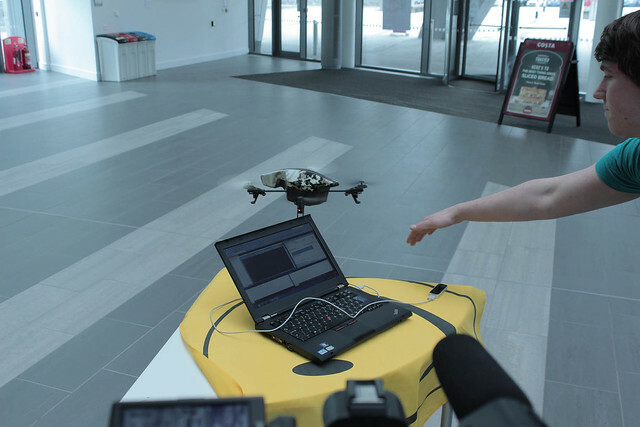 It was really quite fun to fly, and would recommend that everybody should have a go at flying a drone via gesture control. 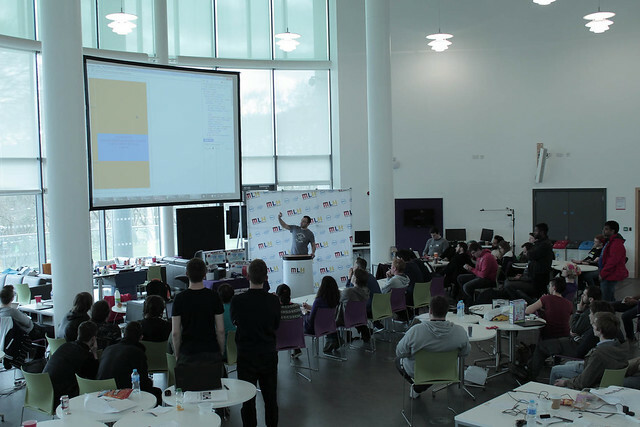 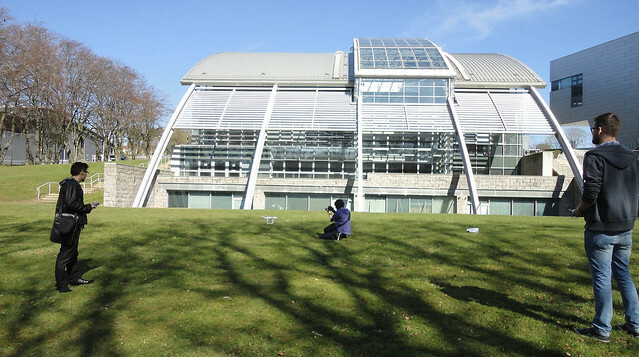 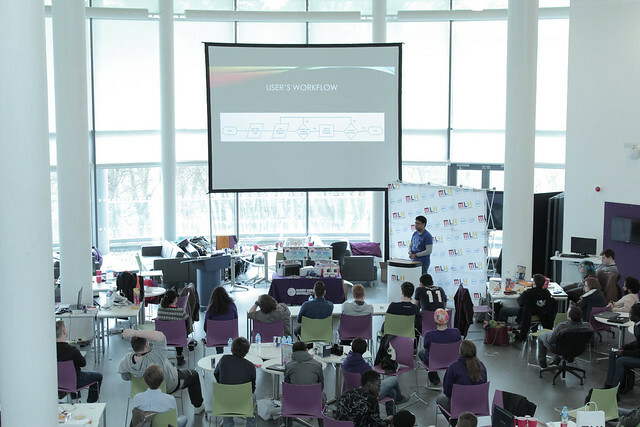 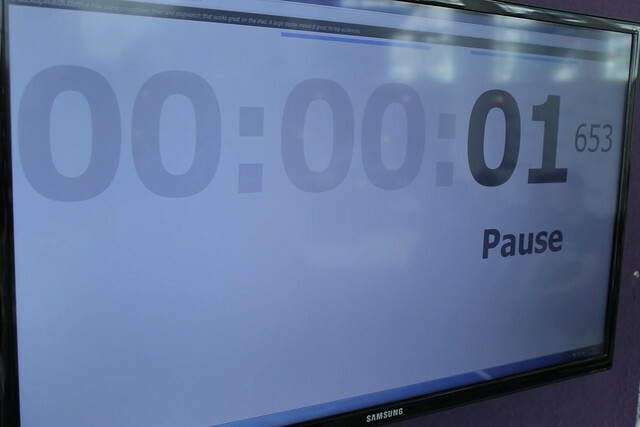 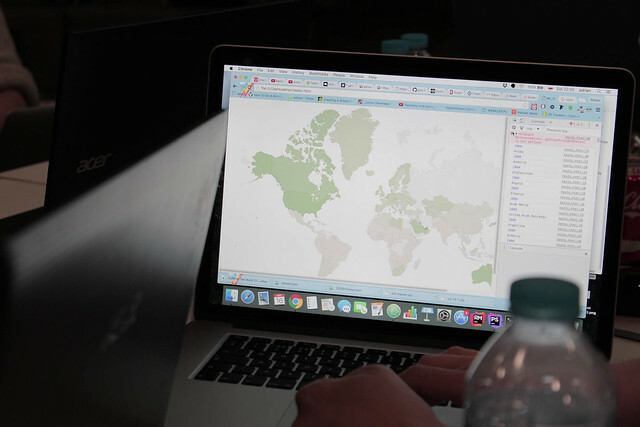 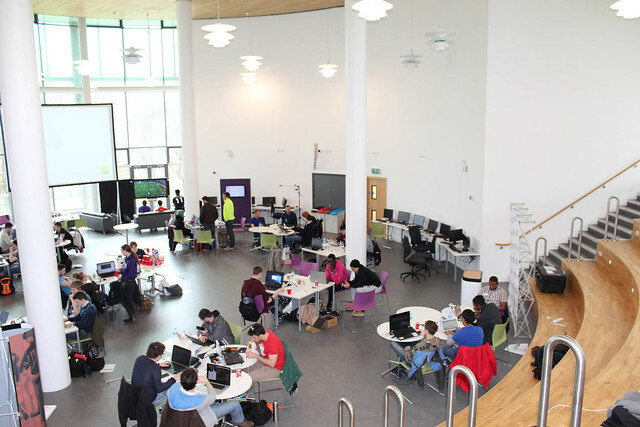 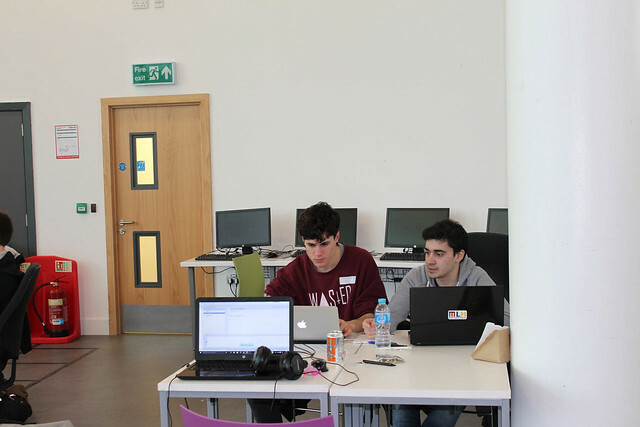 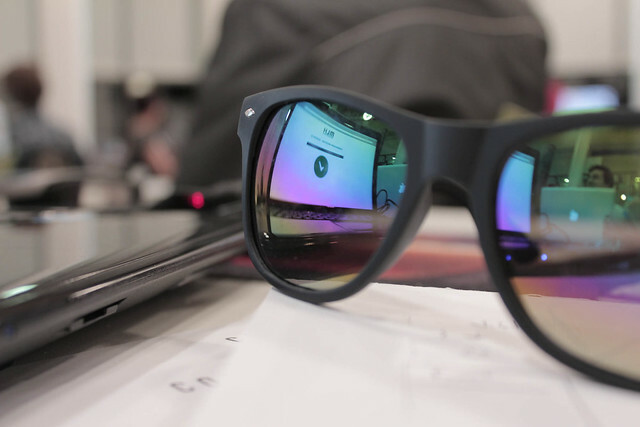 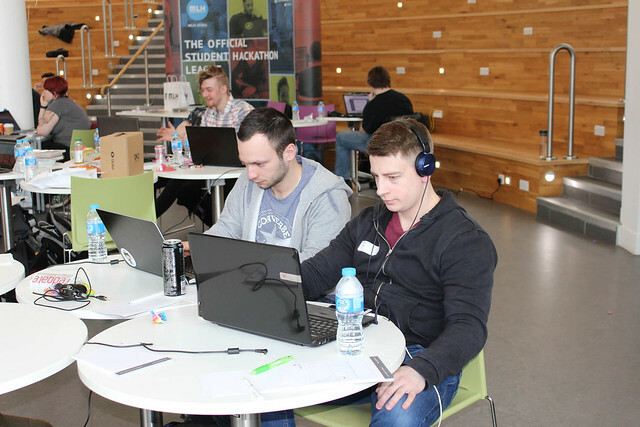 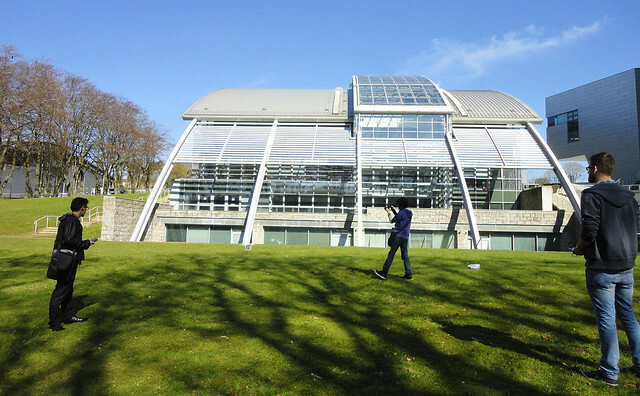 On Saturday and Sunday 16th – 17th April 2016 the Second RGUHack Hackathon (RGUHack 2.0) took place with 51 participants coding for a 24 hour period starting at 13:00 on the Saturday afternoon. 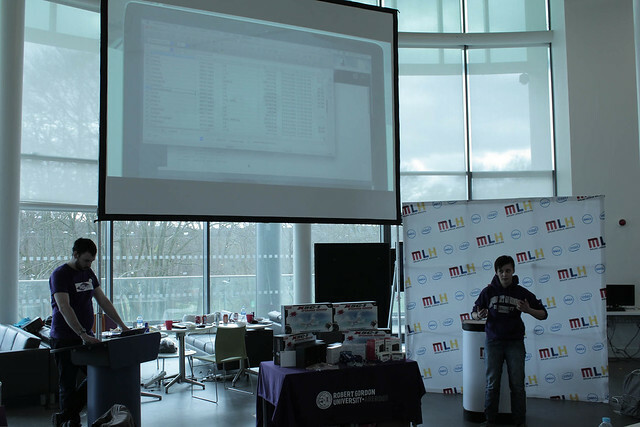 Setup on the Saturday began a little before 08:00 to ensure the venue was ready to go for registration, kicking off at 10:00. 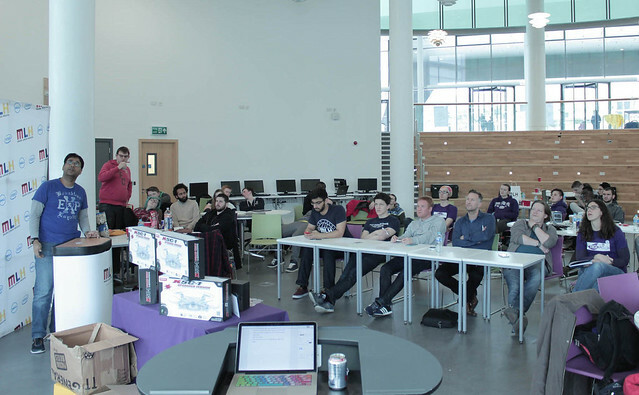 The various challenges were presented at 11:00 followed by a spot of lunch. 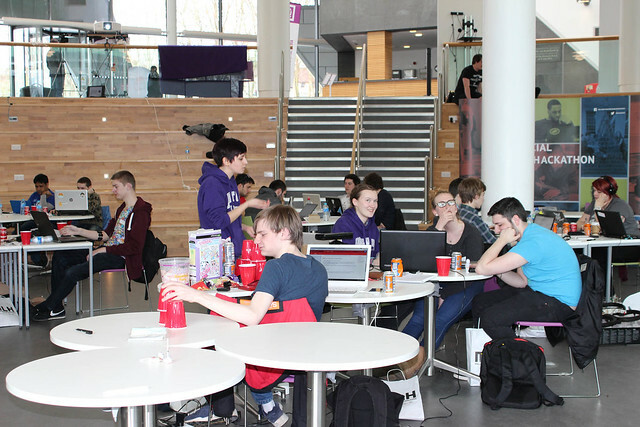 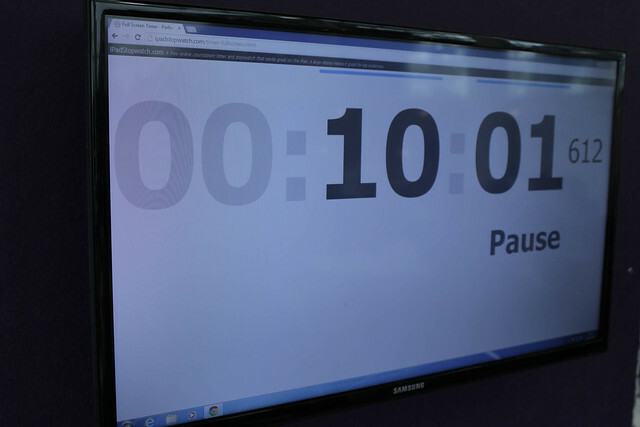 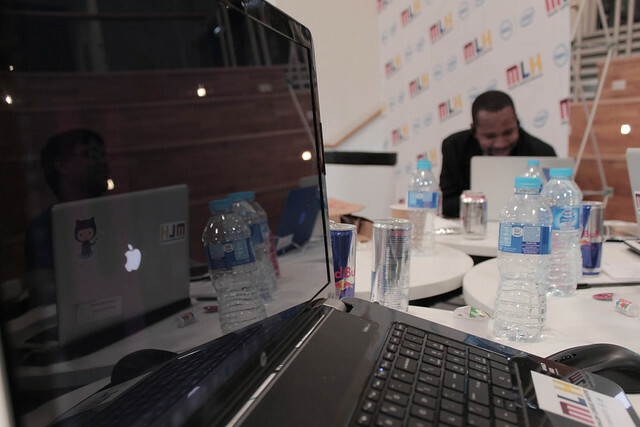 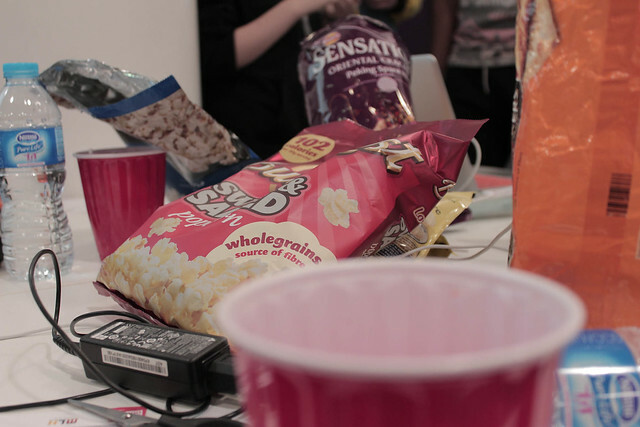 Then at 13:00 the main event kicked off with 24 hours of solid coding and problem solving. 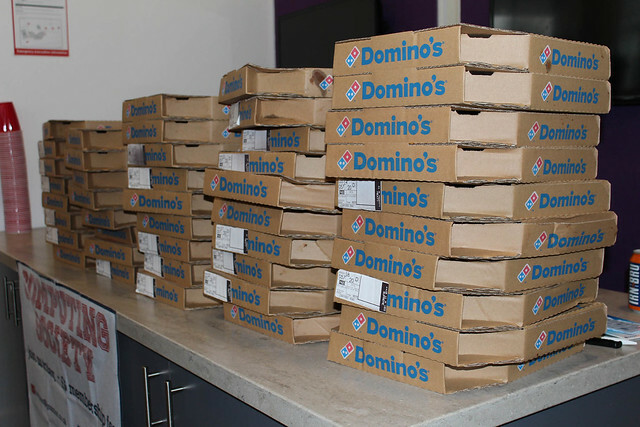 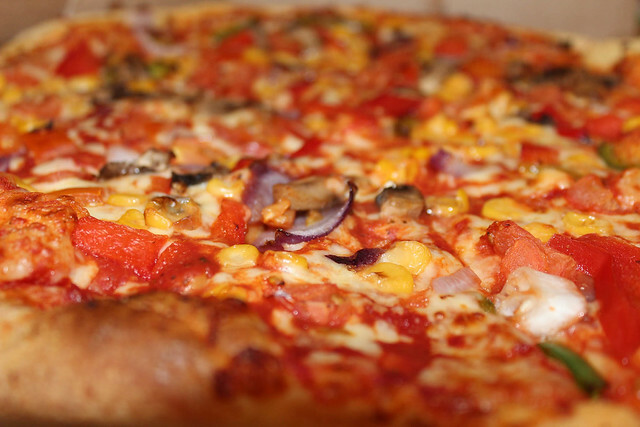 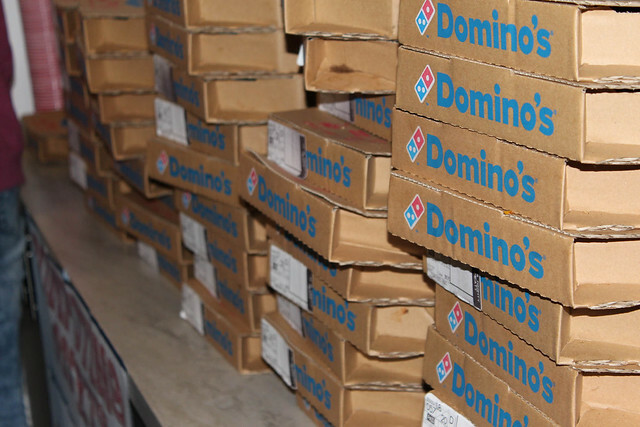 One of the key ingredients of code generation is fuel, therefore at 18:00 a supply of around 45 pizzas from Dominos arrived to keep the coders going well into the night. 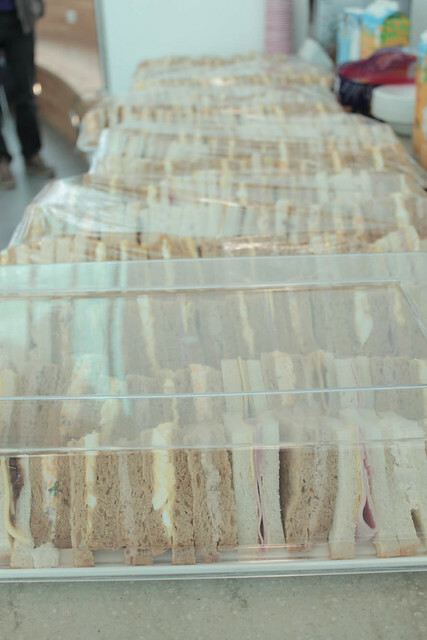 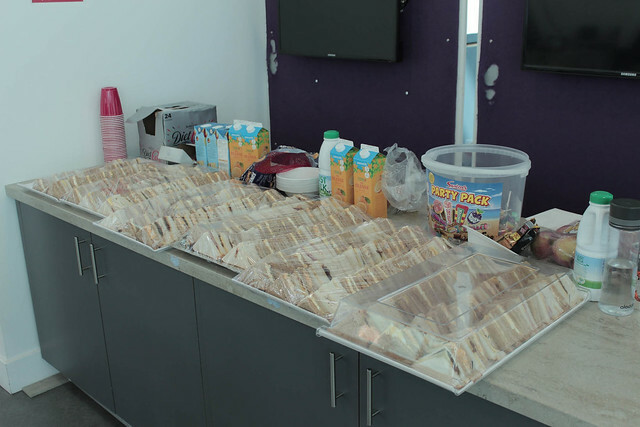 Further refueling took place again around midnight with plenty of snacks in between until Breakfast around 07:00 – 08:00 on the Sunday morning. 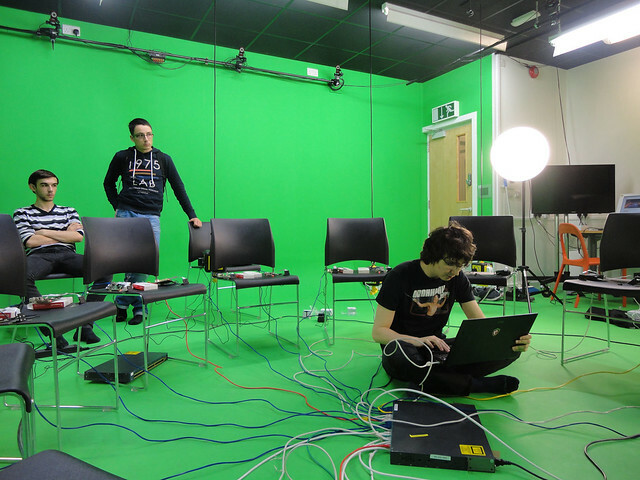 Then it was into the final stages of testing and debugging before getting ready to present the work. 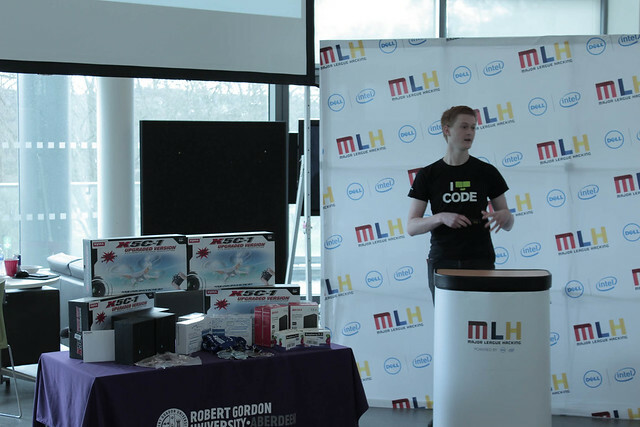 Coding time eventually came to an end at 13:00 on Sunday and once again it was time to refuel in preparation for the presentations and prize giving. 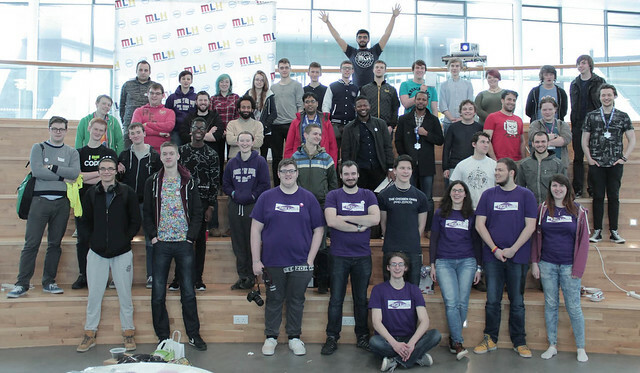 After that it was time to say farewell to the Coders/Hackers around 15:45, finishing up with some Group Photos. 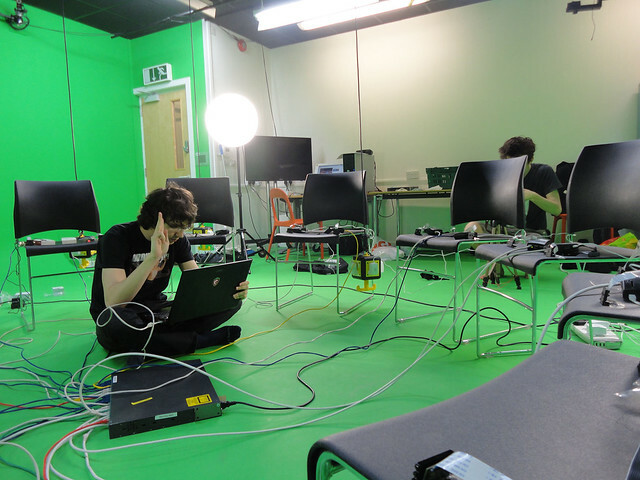 Then it was time to tidy up after the event, all this was done and dusted by around 17:00. 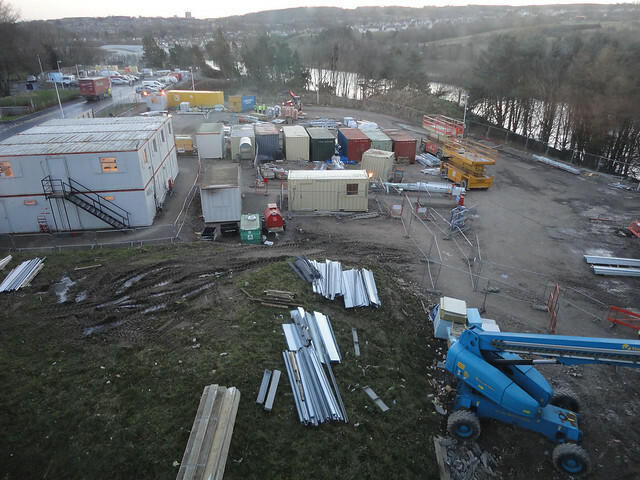 Just a few little bits remained to be packed up and posted off to MLH, with the last person leaving the building at 17:45. 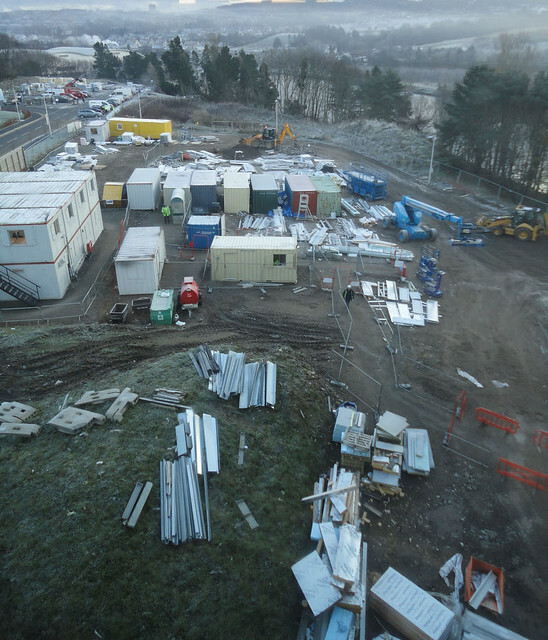 Its likely that over the next few days some more photos, videos and the like will be made available online. 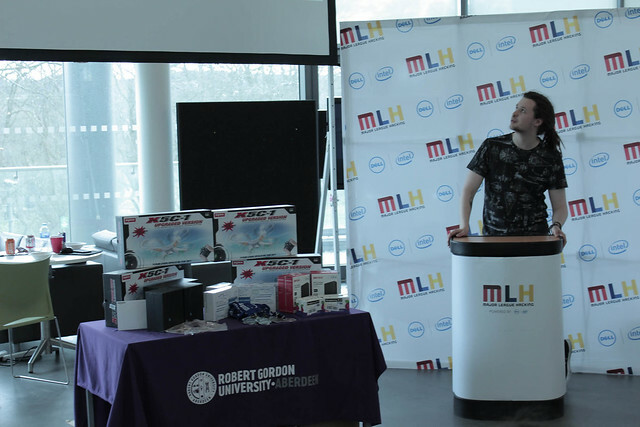 As a few people were involved in taking pictures during the event & we had 3 GoPros setup around the venue recording a time-lapse at 30 second intervals. 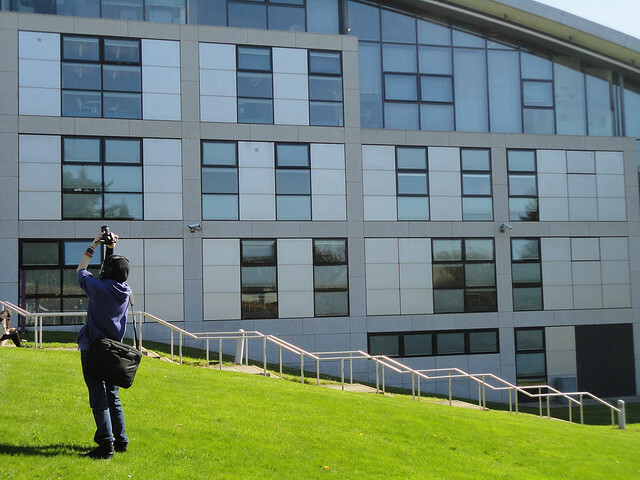 I hope you enjoy the 2^7 pictures available below and via the flickr album (Online). 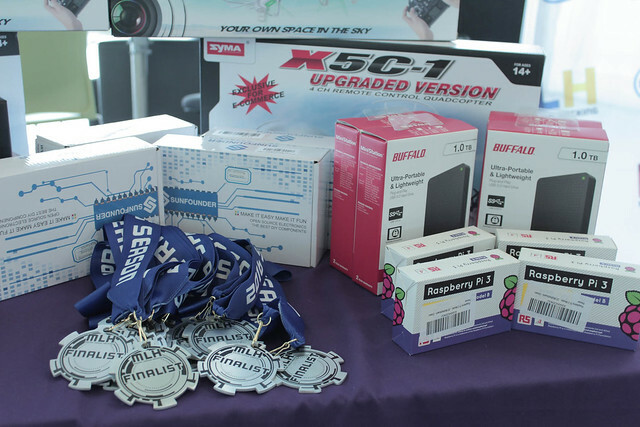 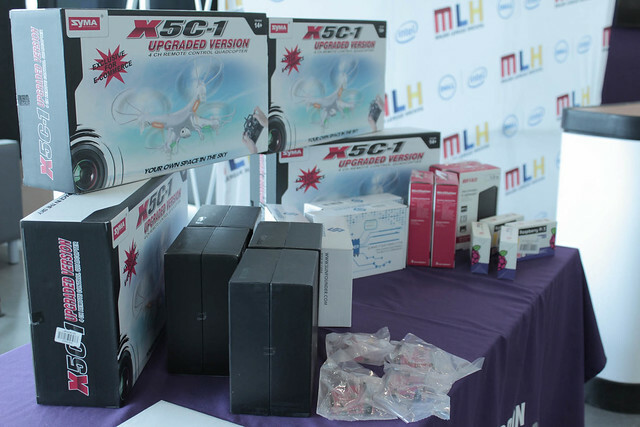 The photos below and (Online) via flickr, should give a good sense of what the event was like, starting with the final group photo and working back to the the very start and the display of the hardware devices available to explore. 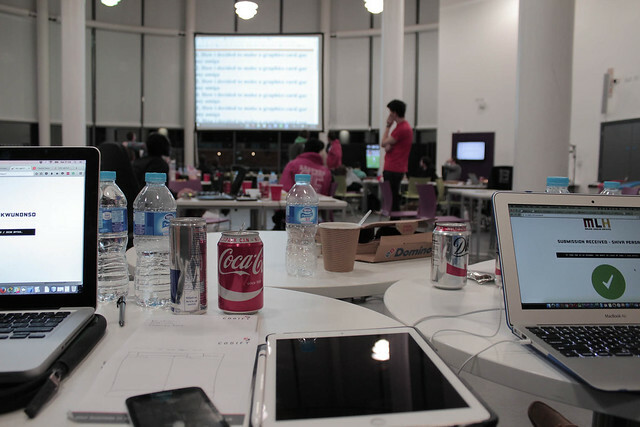 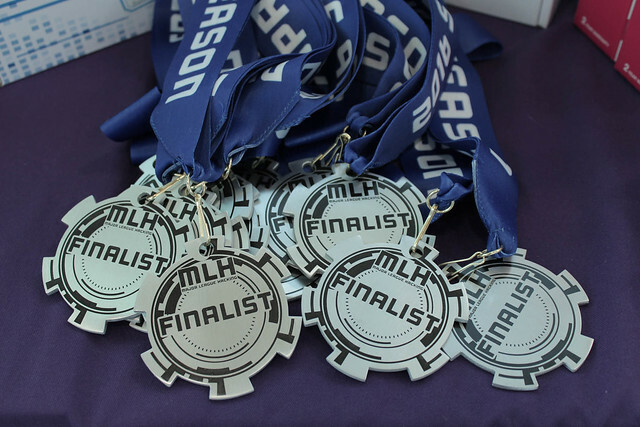 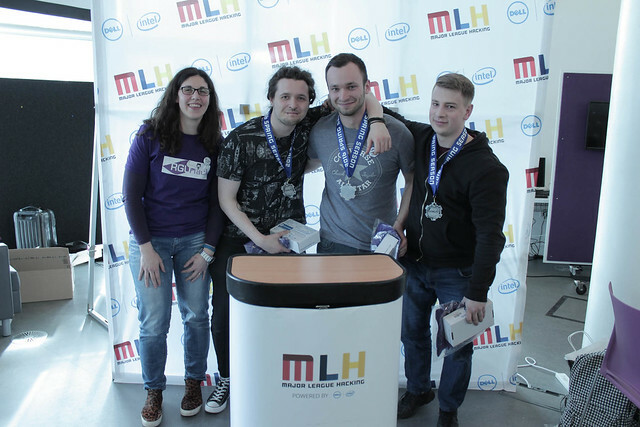 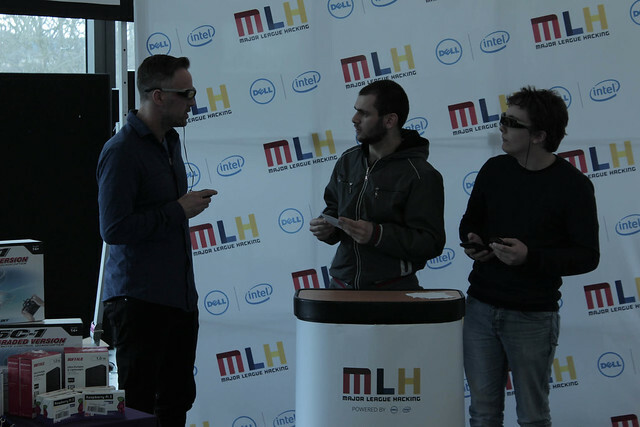 One can get a good sense of what last years Hackathon was like by taking a look at the following Blog post (Online). 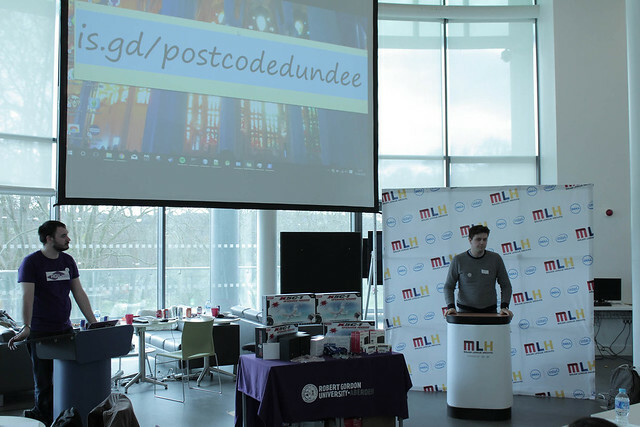 A big word of thanks goes out to all the Sponsors – ThePropertyAngel, Codify, GraduateAI, QCode, Sie, Redgate, Brightree, MLH & the School of Computing Science and Digital Media. 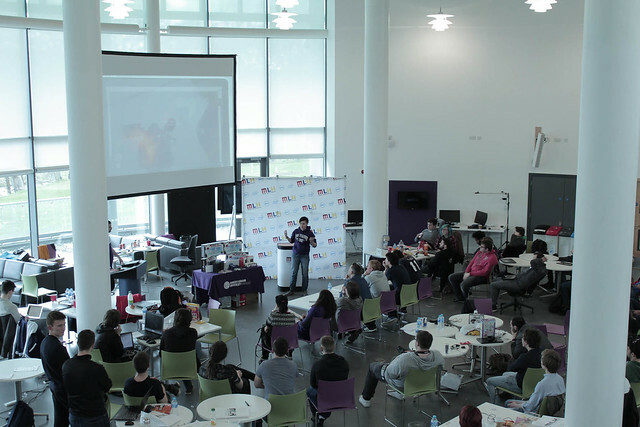 In particular ThePropetyAngel and Brightree whom had representatives present during the afternoon of Saturday and again on the Sunday to view the presentations at take part in the judging panel. 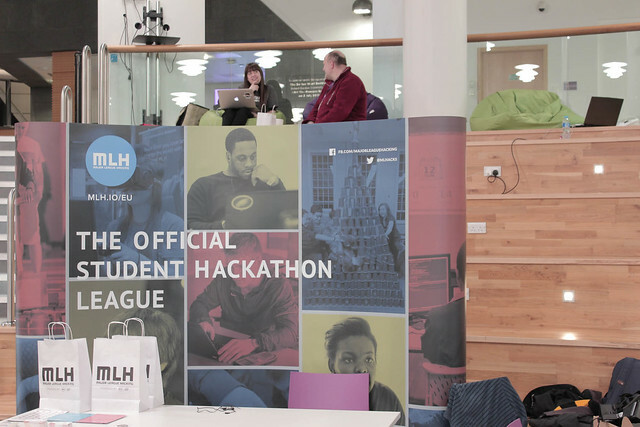 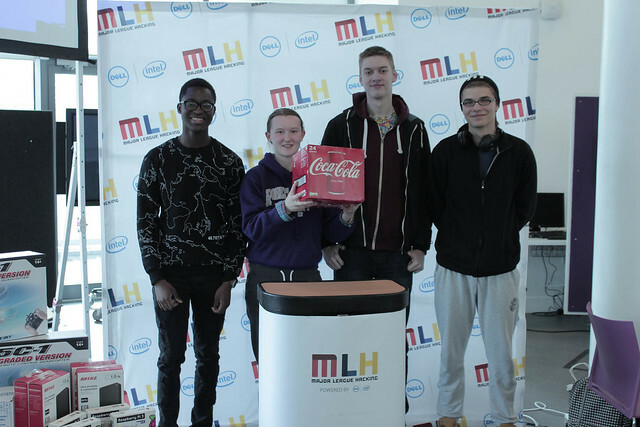 Myself @dcdoolan, John Isaacs @wilefireone and Sean Sturley @TheBitShepherd were present from the School to help ensure the event could take place & help out the student team with the logistics of running the Hackathon on campus. 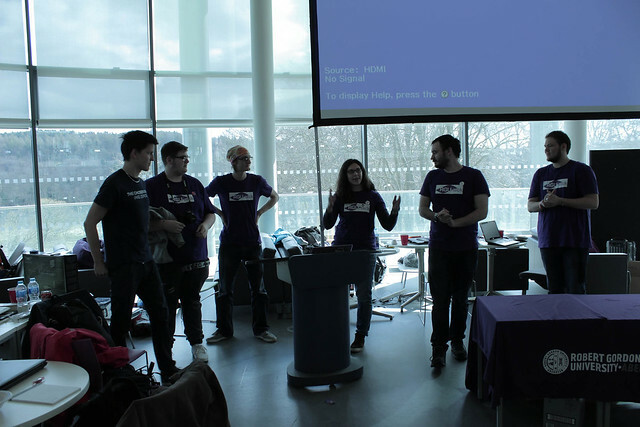 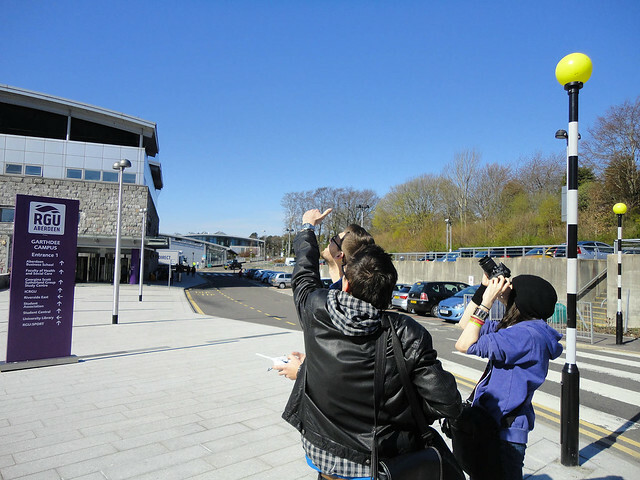 You may wish to checkout the RGU Hackathon Website (Online), Twitter Feed (Online), or Facebook page (Online) to see more. 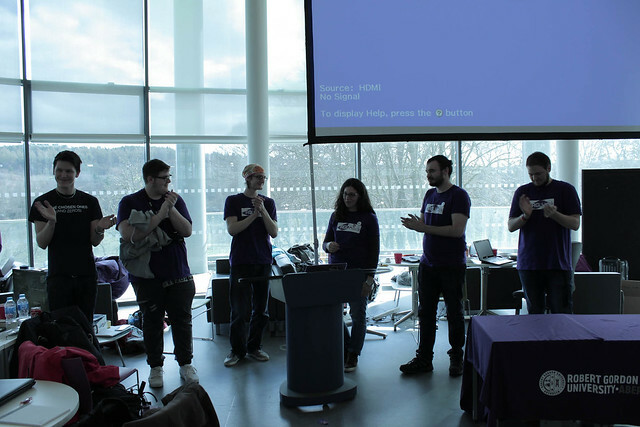 A big round of applause should certainly be paid to the team of half a dozen students who were instrumental in making this event a reality. 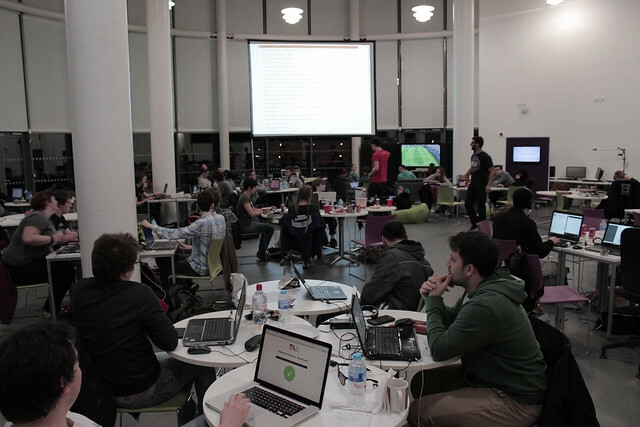 Hopefully this annual Hackathon event will go from strength to strength. 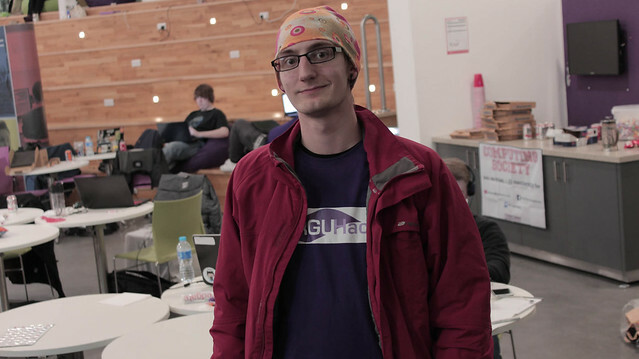 I’m sure we all can’t wait to see what RGUHack 3.0 will be like next year. 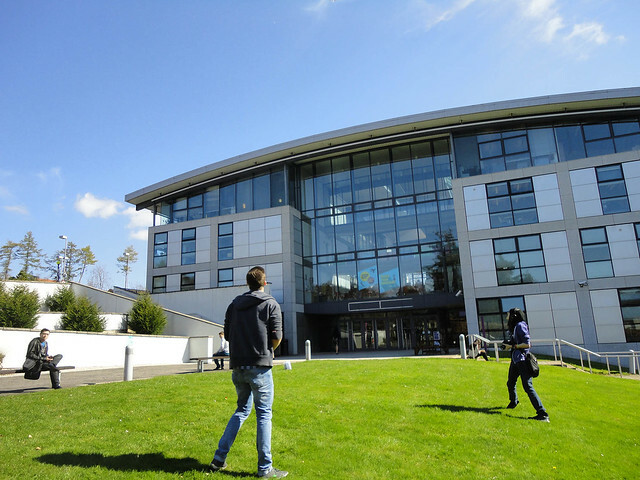 As the title says, the School of Computing Science and Digital Media Linkedin Alumni Group (Online) has reached 700 members. 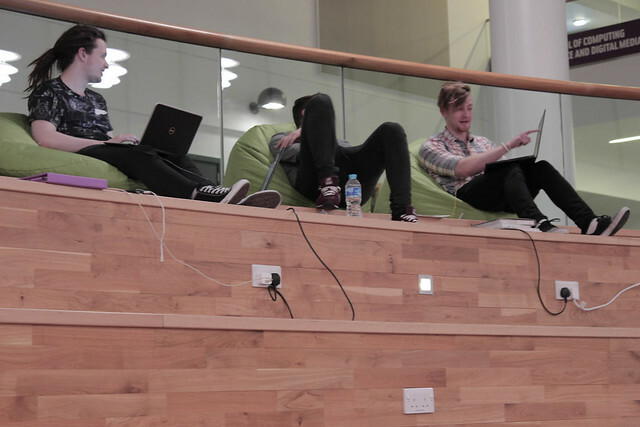 The following embedded tweets should give some sense of how the Group has grown over the past few years. 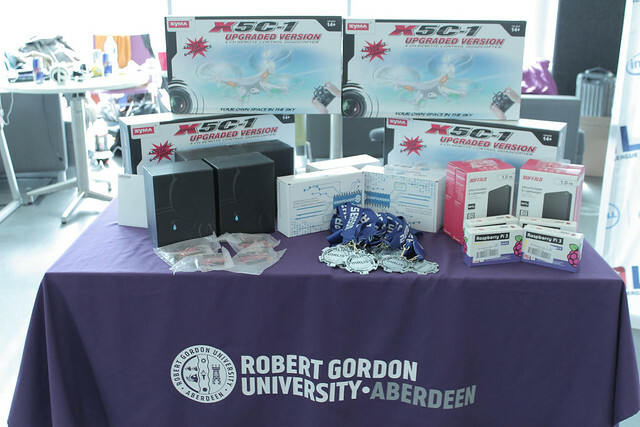 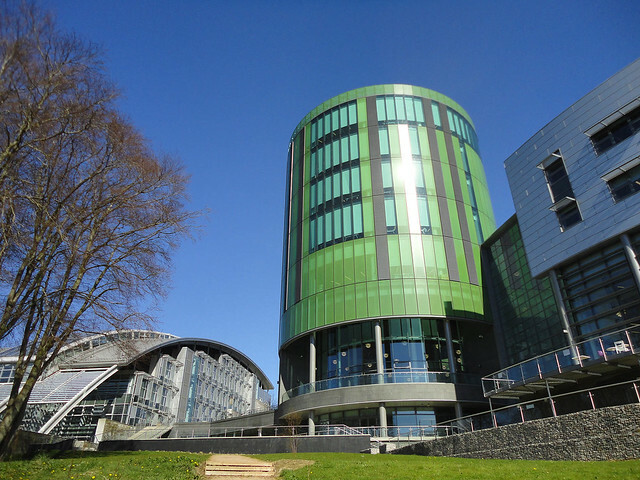 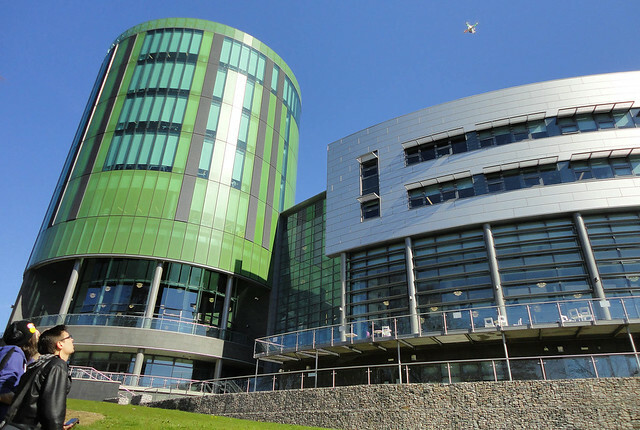 @RGUComputing Just over halfway now to 1000 LinkedIn members on our Alumni Group (http://t.co/vzN8mrm8gR), just 497 to go now. 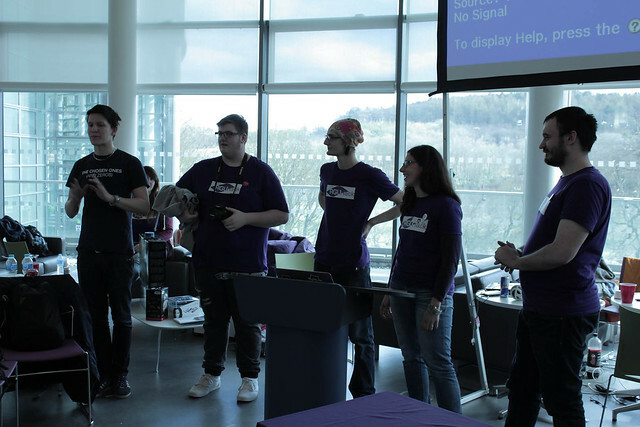 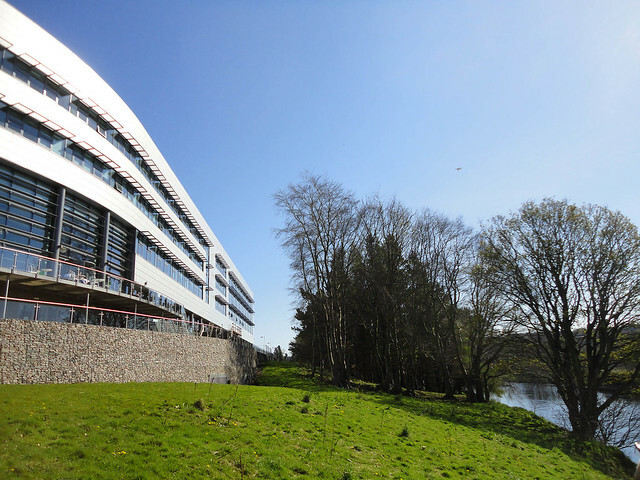 School of Computing RGU LinkedIn Alumni Group Reaches 200 Members http://t.co/RVfml8IF via @dcdoolan <– why not join if it applies to you? 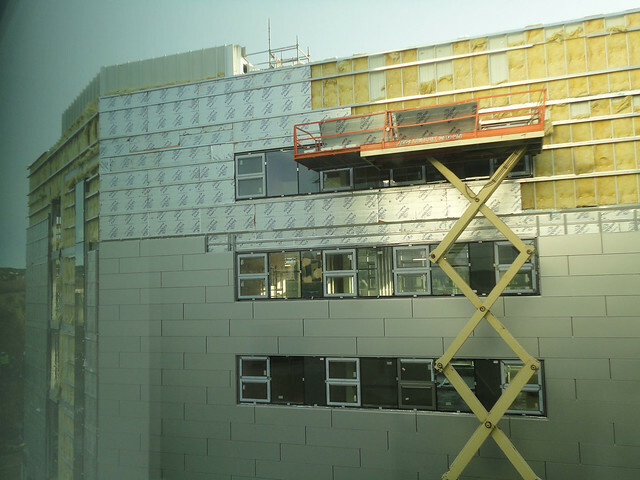 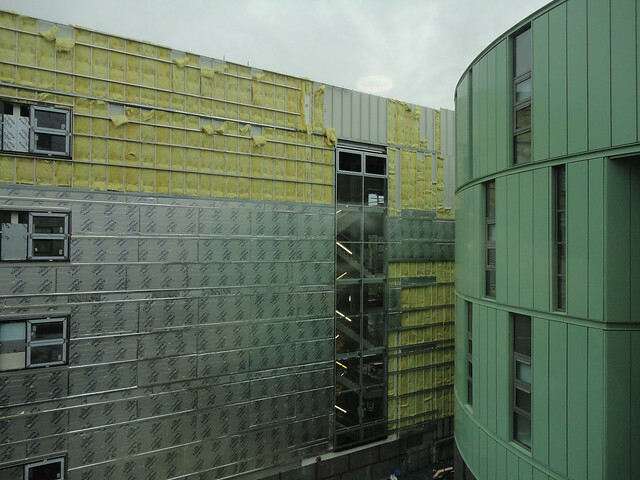 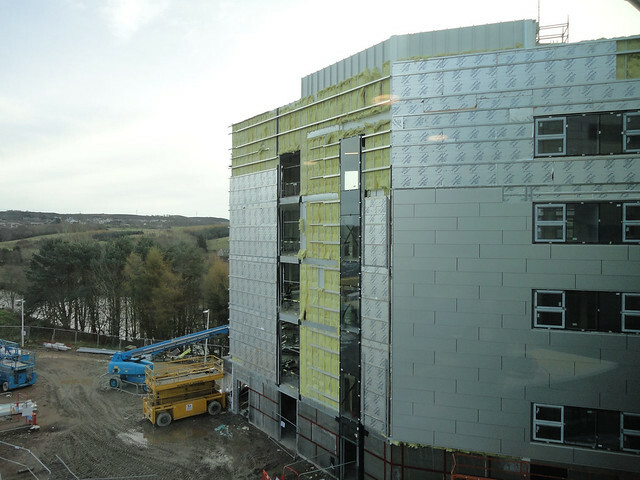 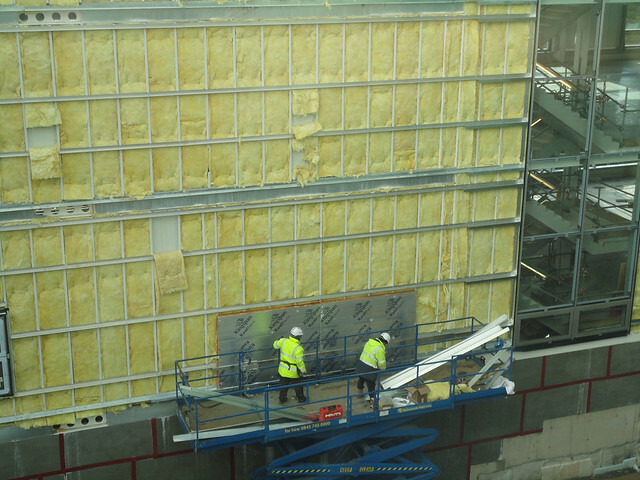 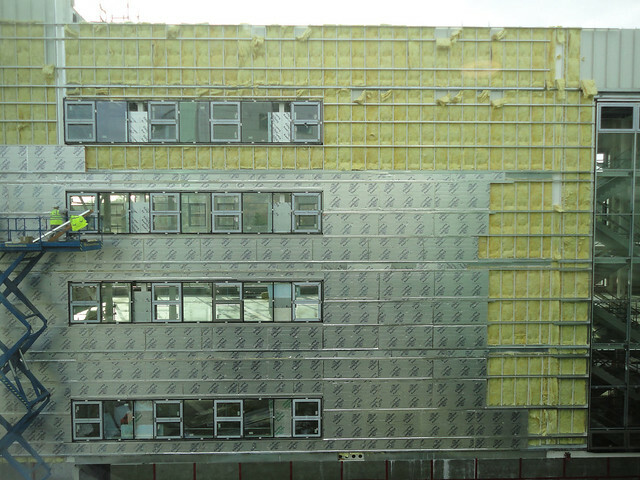 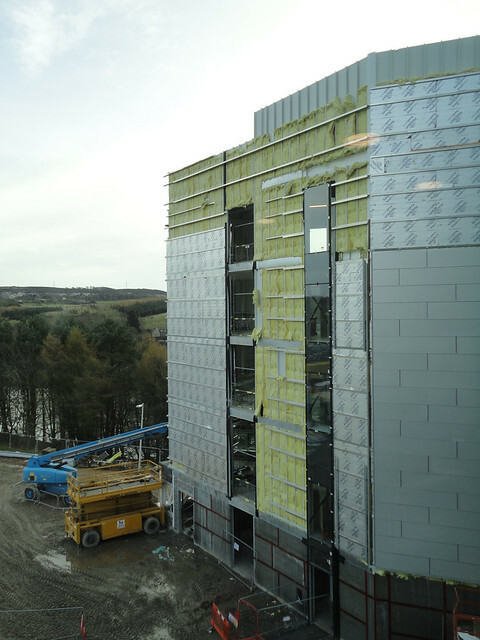 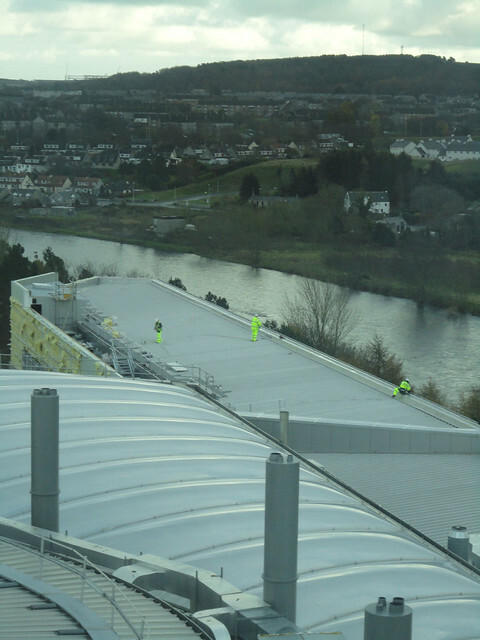 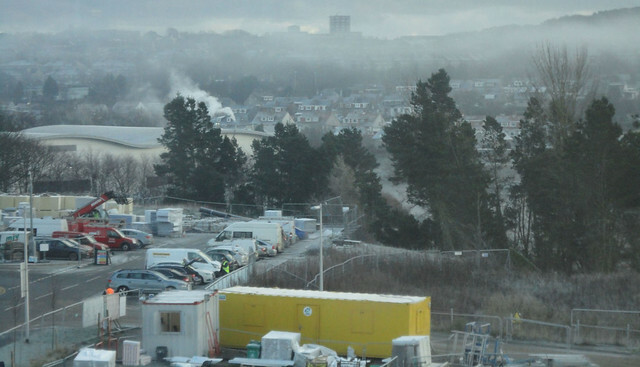 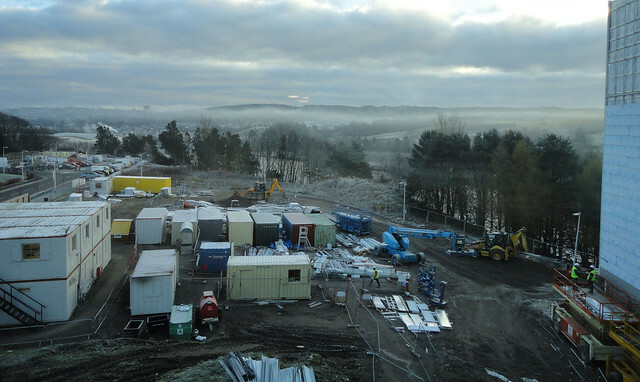 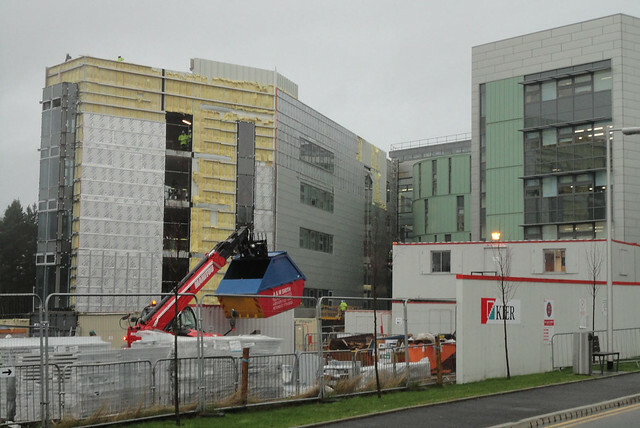 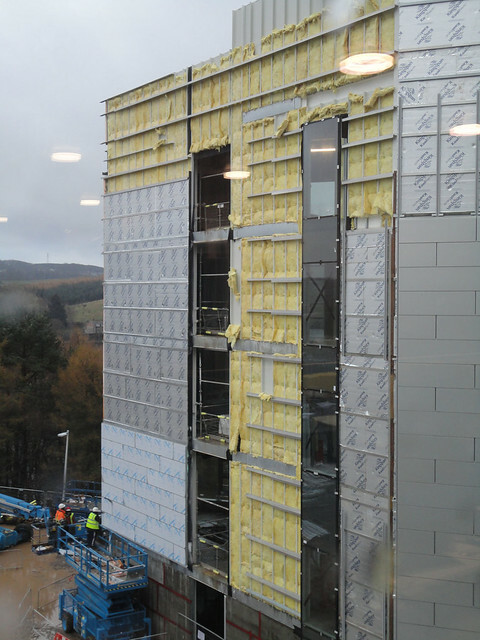 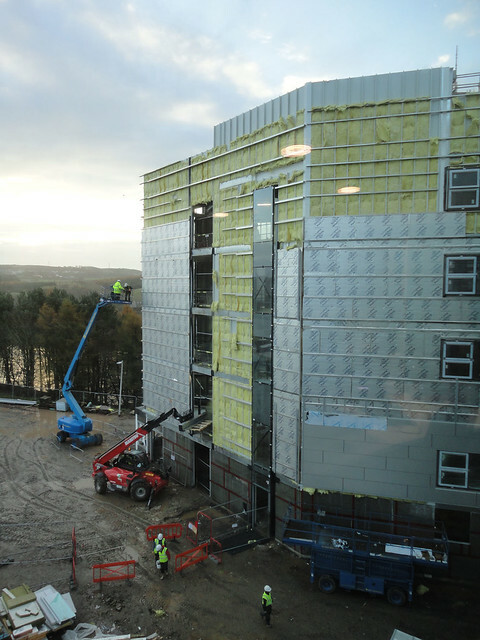 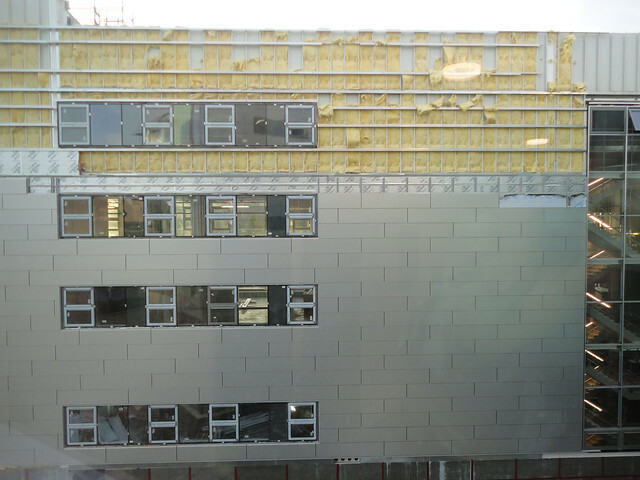 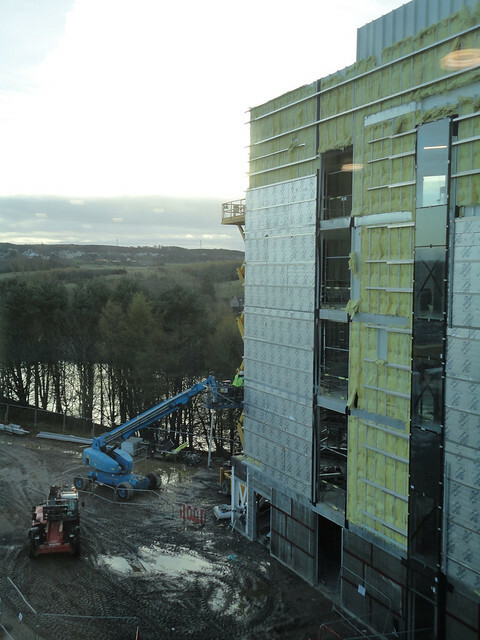 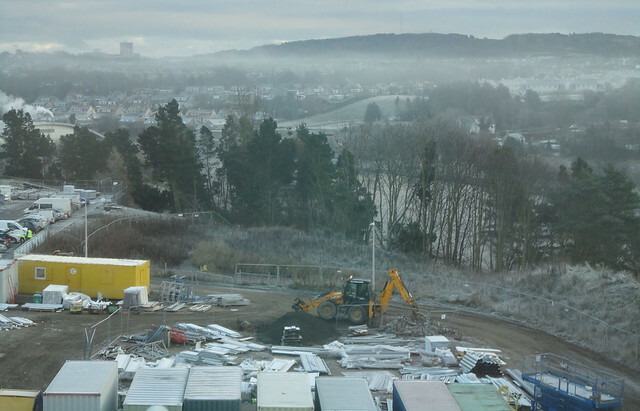 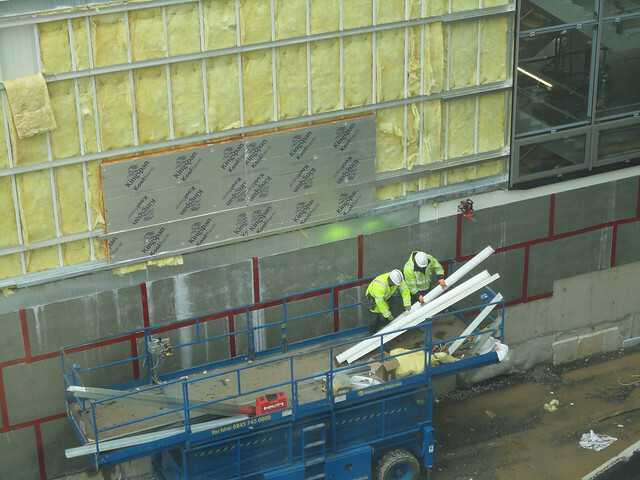 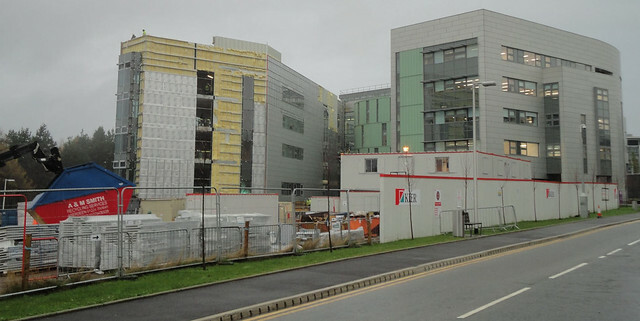 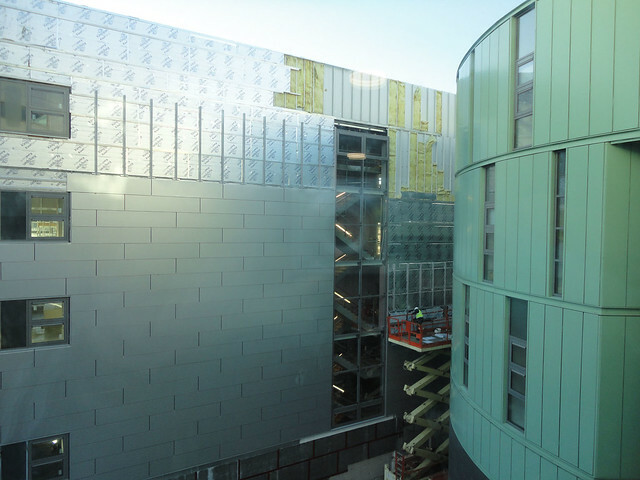 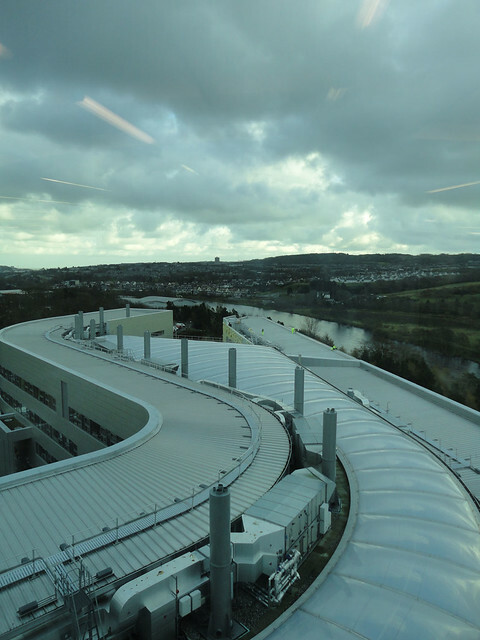 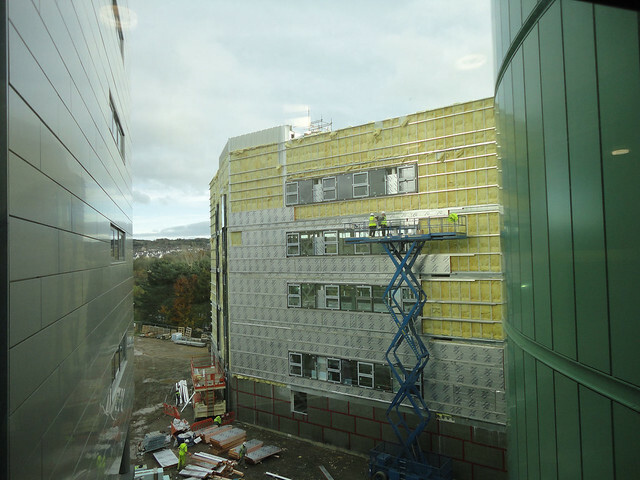 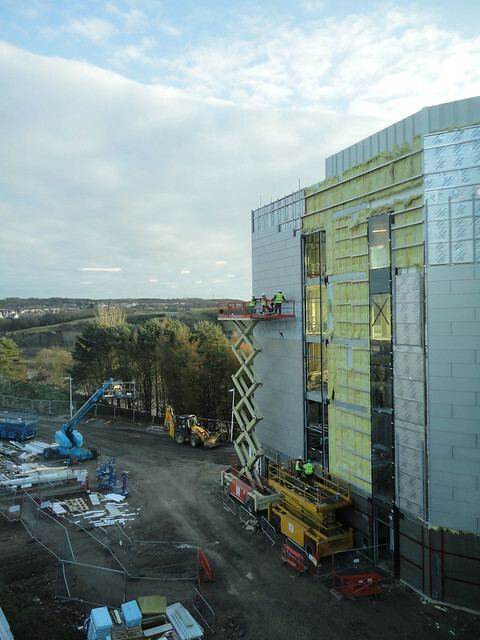 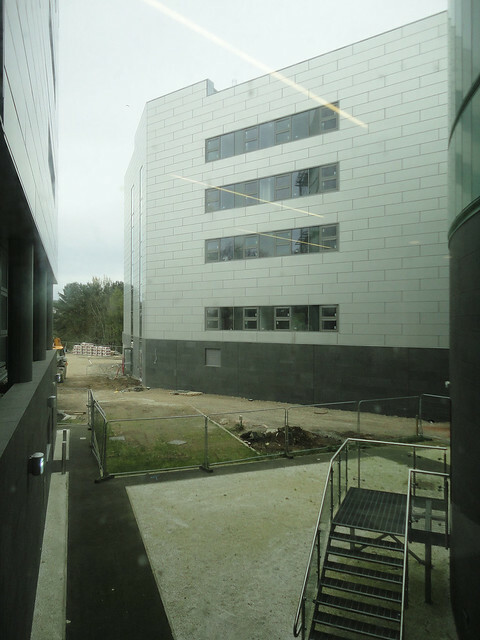 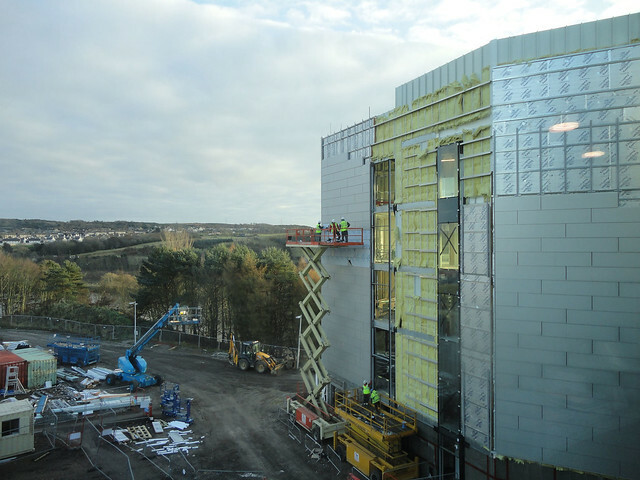 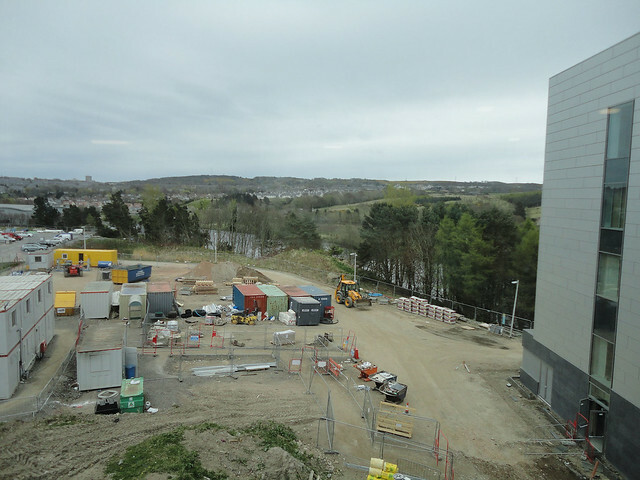 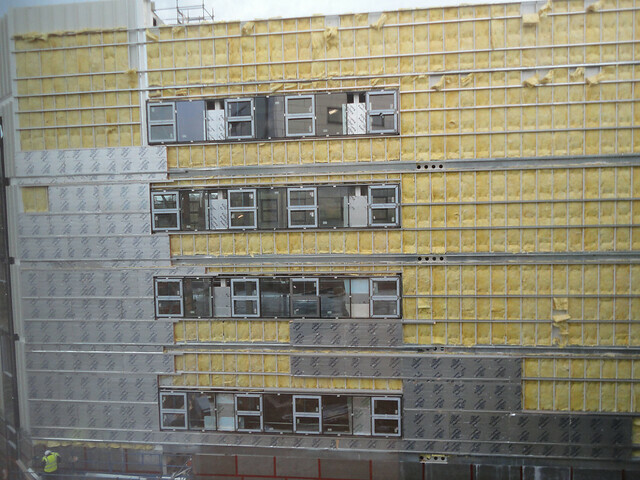 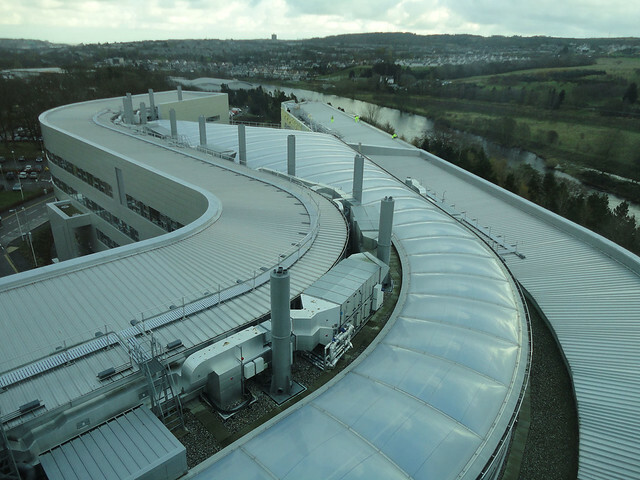 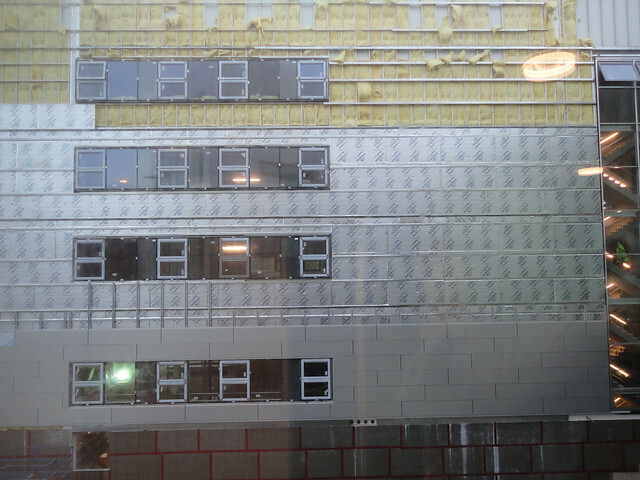 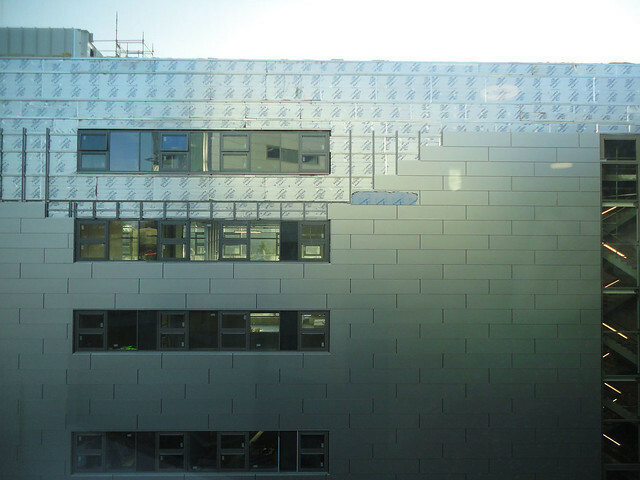 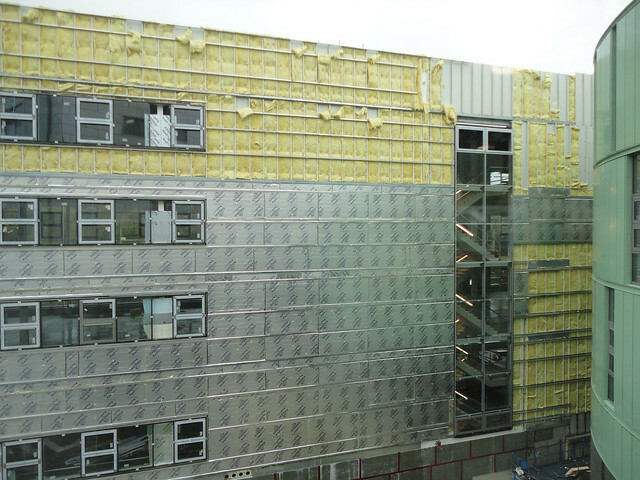 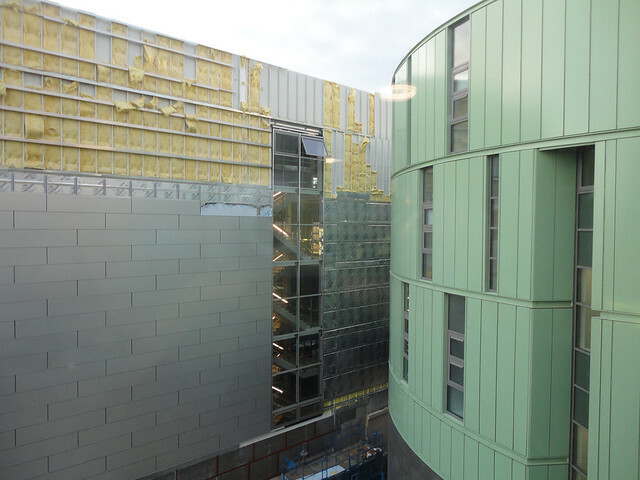 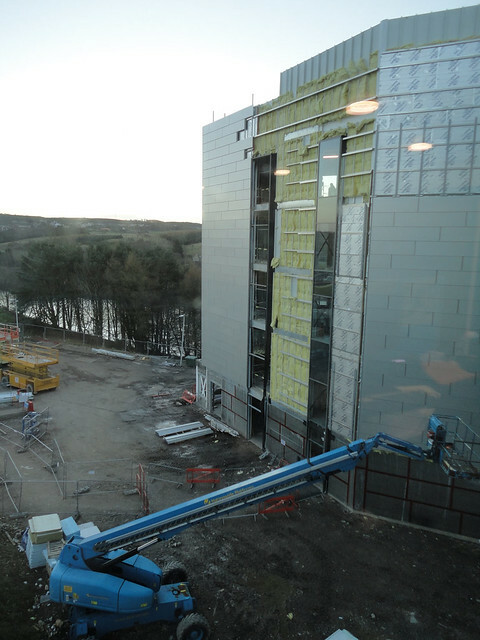 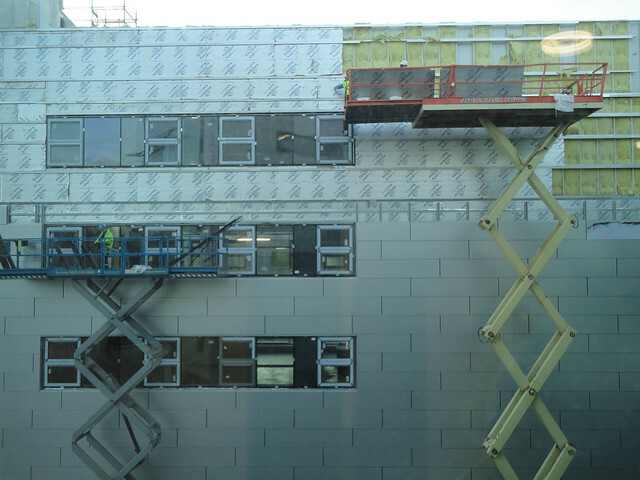 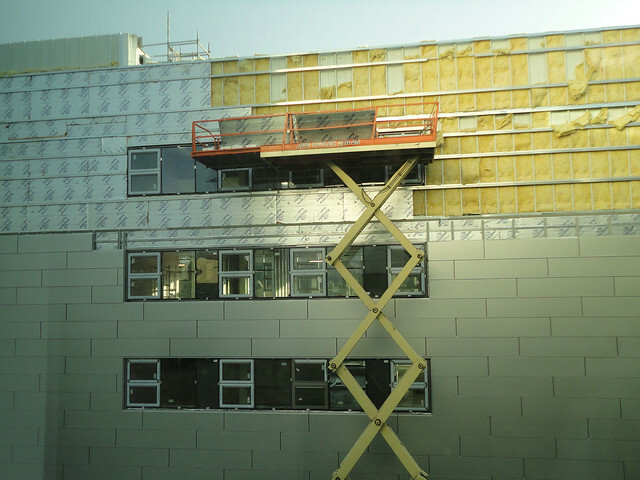 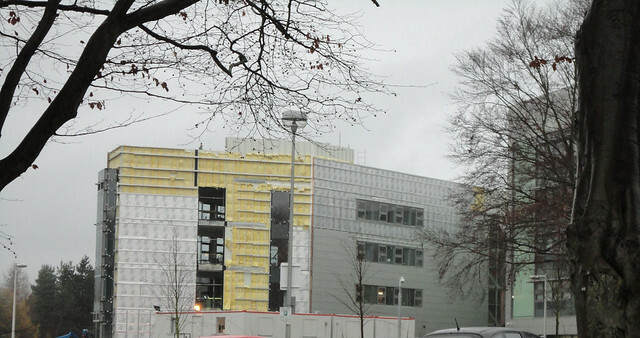 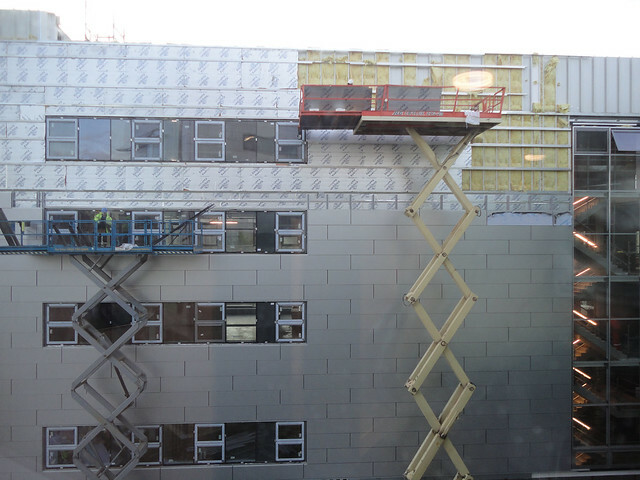 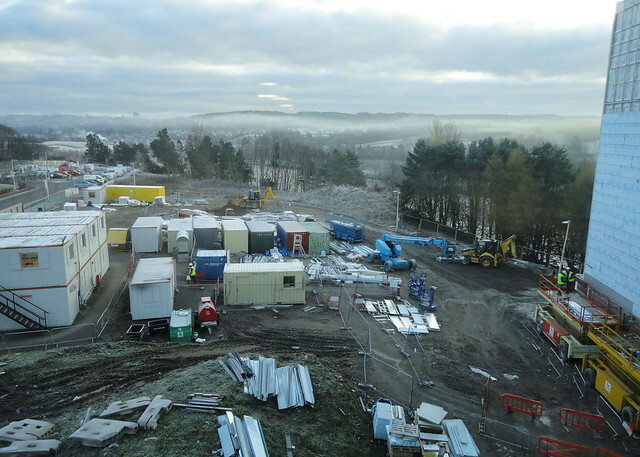 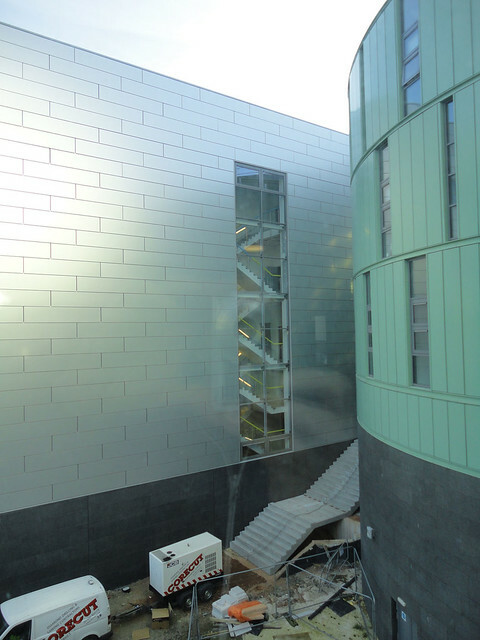 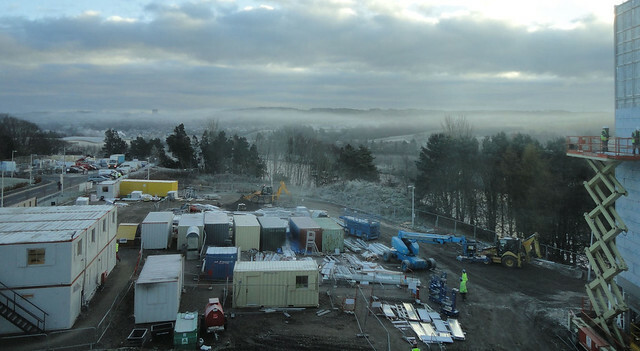 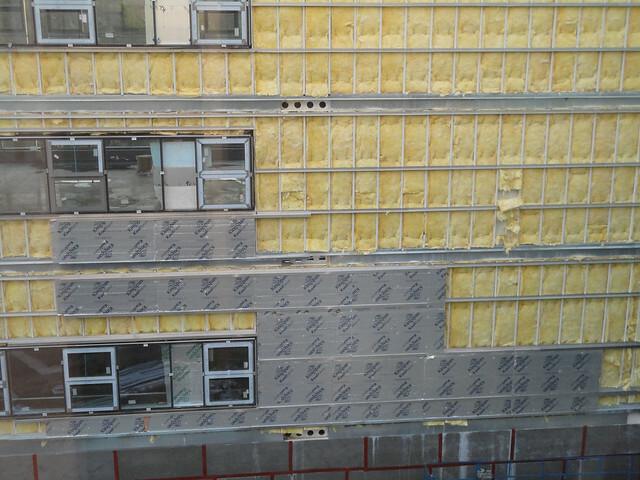 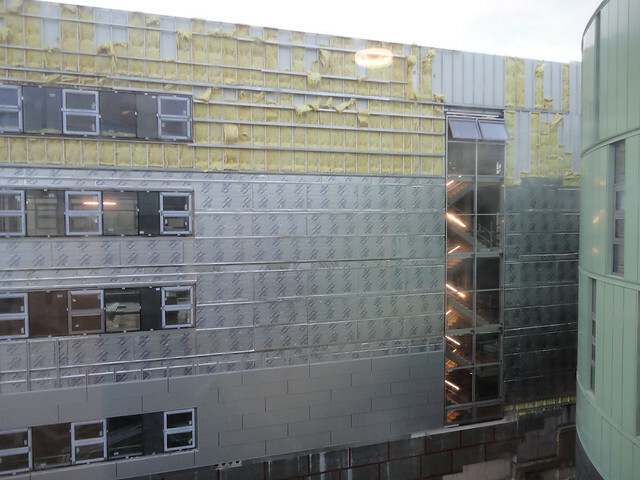 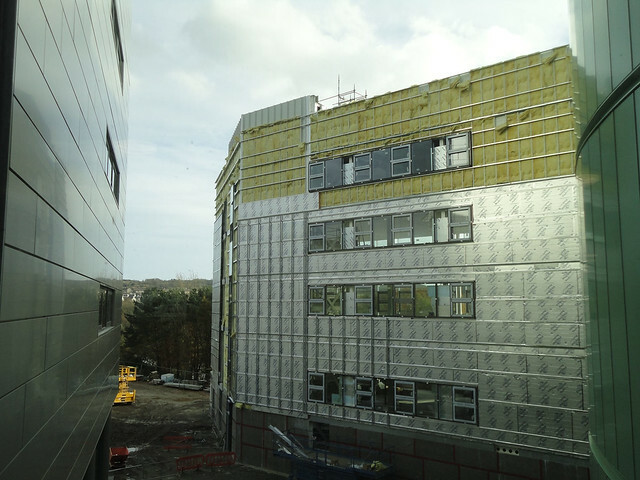 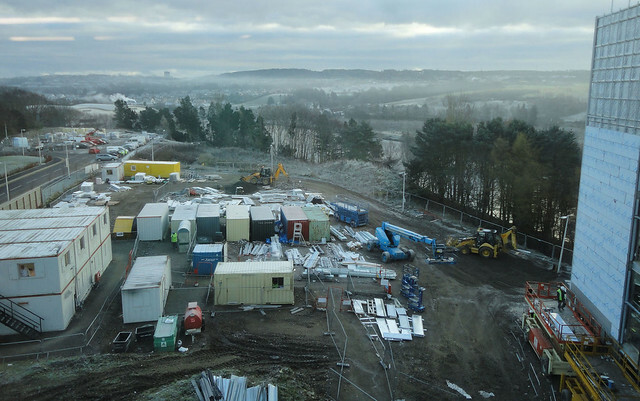 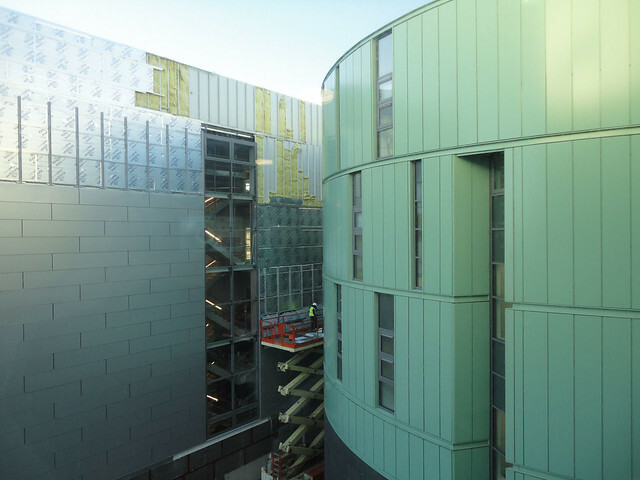 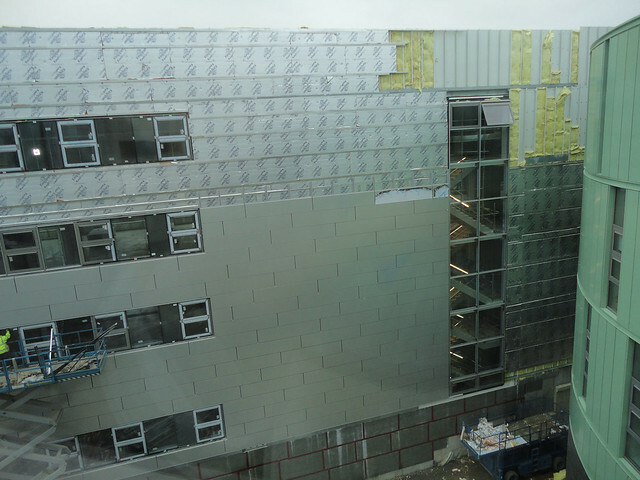 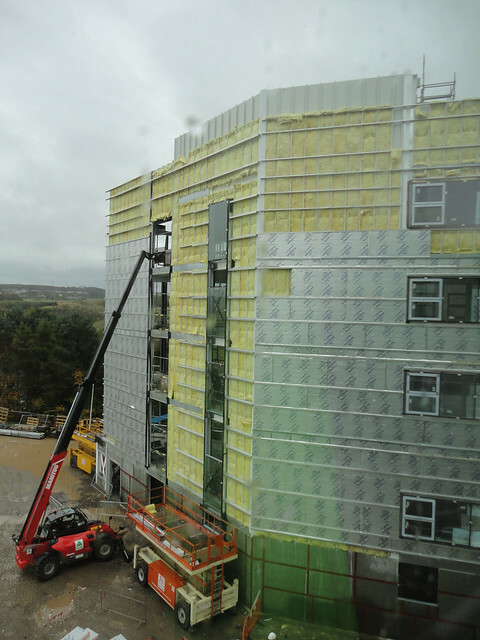 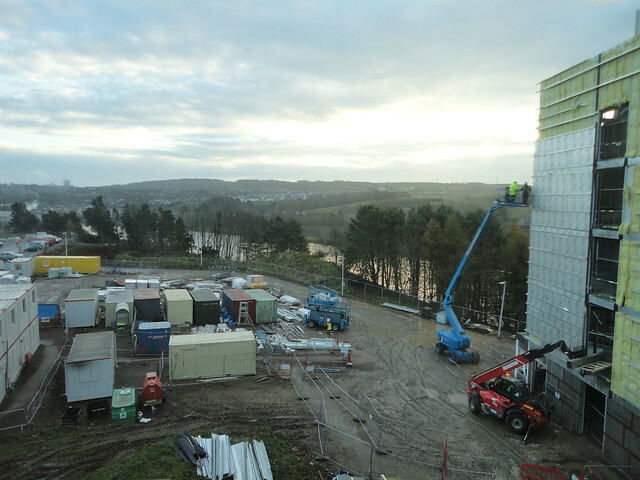 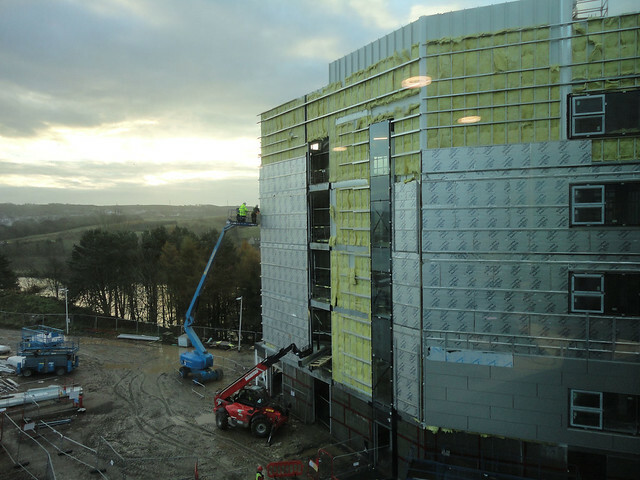 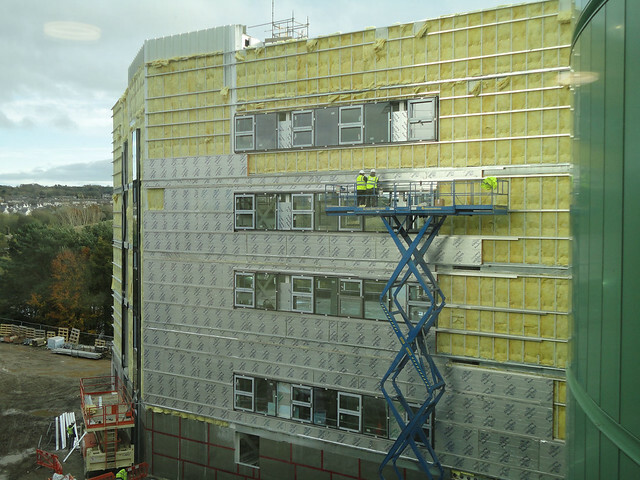 I have made a number of posts charting the progress of the extension to Riverside East at the Garthdee Campus of Robert Gordon University. 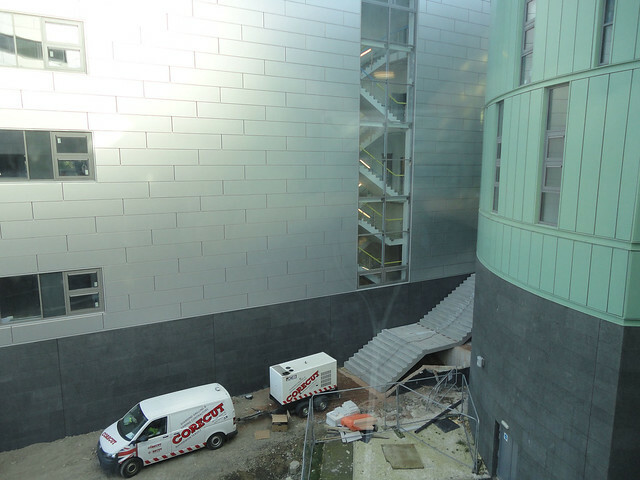 All the exterior work is essentially complete with the addition of some concrete steps in the past few days. 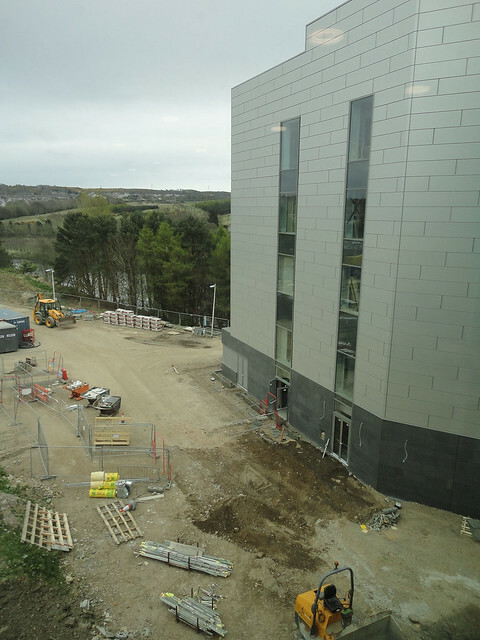 As you can see from the previous posts and the images below, the extension is moving along and should be ready for use this summer. 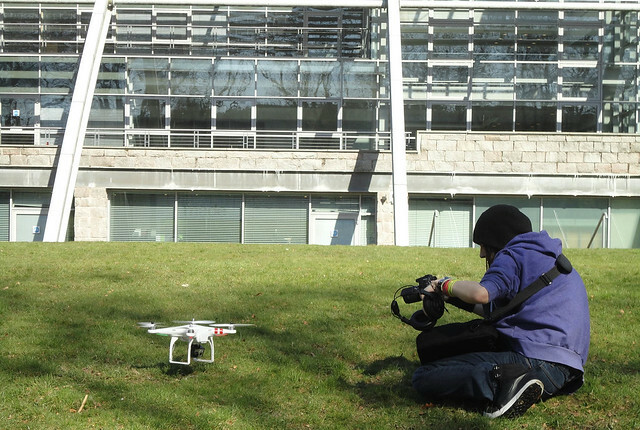 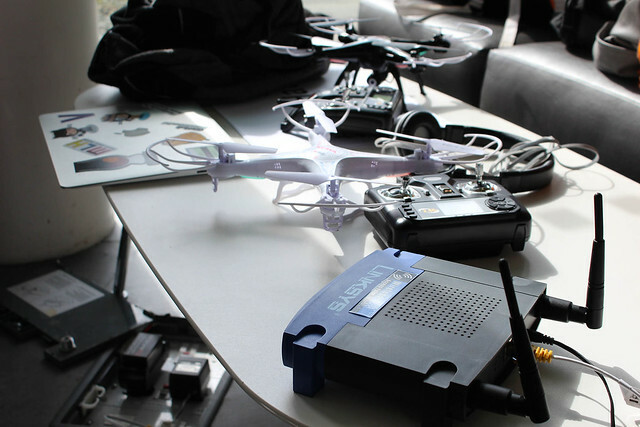 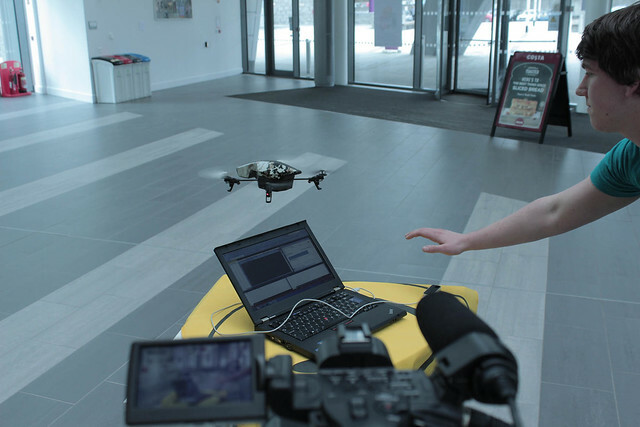 In a recent post I mentioned about helping out some students developing a tutorial on Quadcopters as part of their coursework for a 3rd year module of mine called Interactive Multimedia. 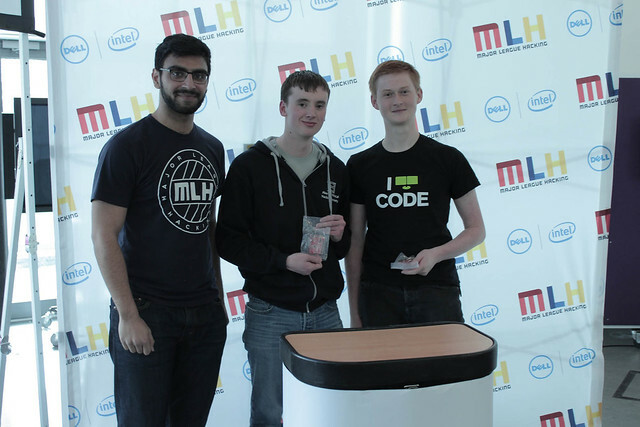 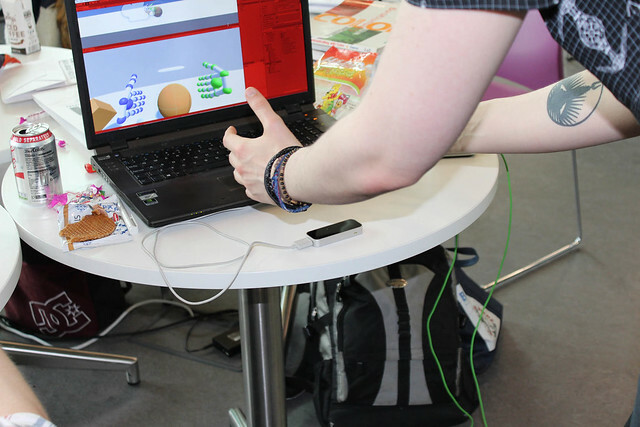 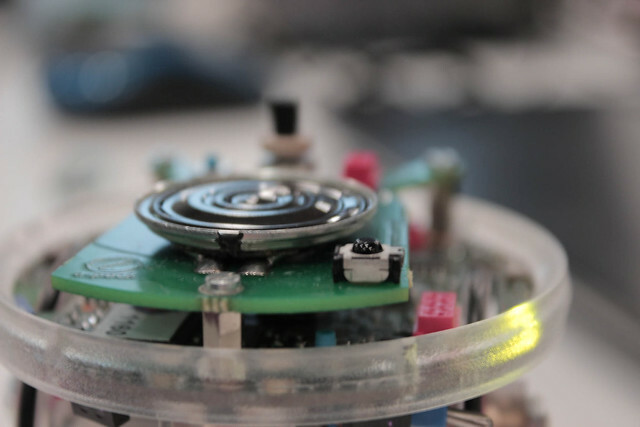 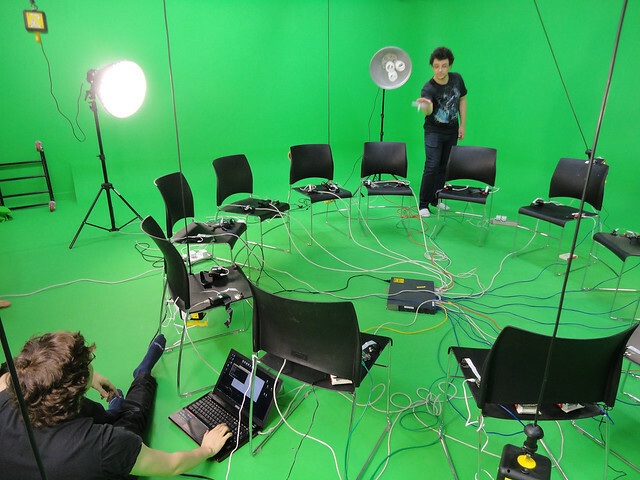 This post is about another group of students who worked on building and coding a Raspberry Pi based Bullet Time rig – again for the same module. 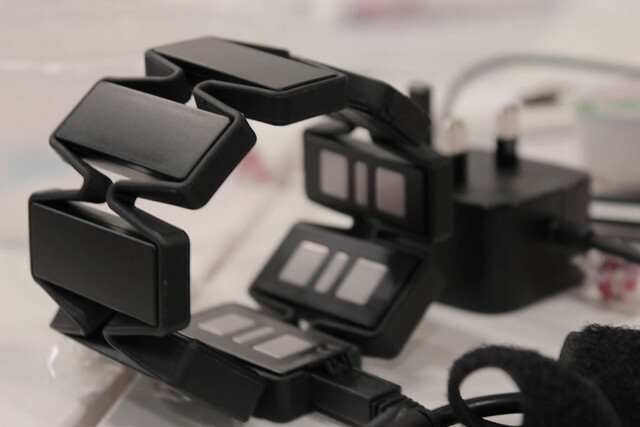 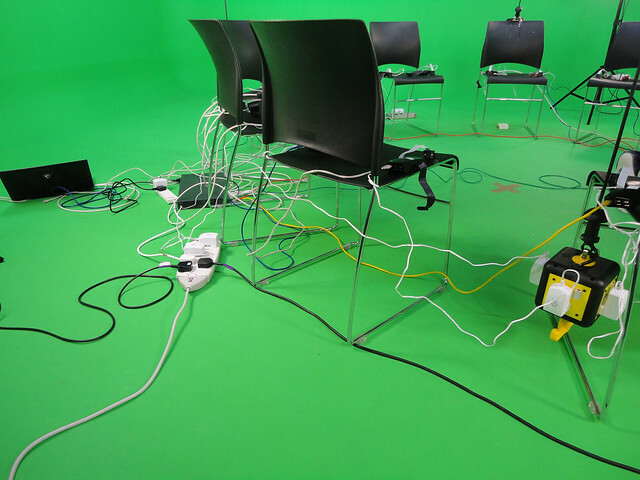 The idea for this came from Dr. Andrew Robinson who had built a 48 Camera system with a PiFace Control and Display (Online). 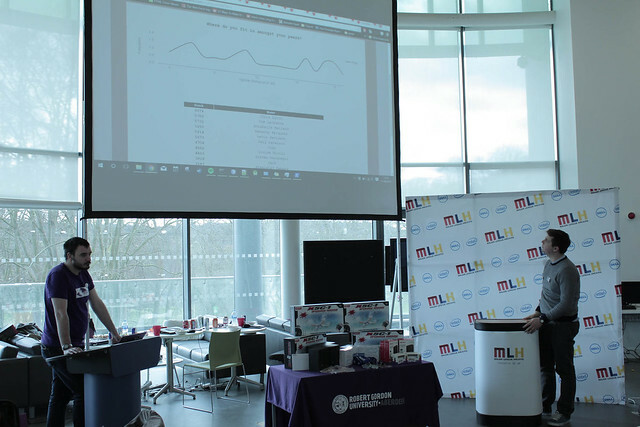 It would have been great had it been possible to demonstrate the system at the recent 24 Hour Hackathon just a few days before but time and space didn’t really allow for that to happen, so here’s some info about the rig instead. 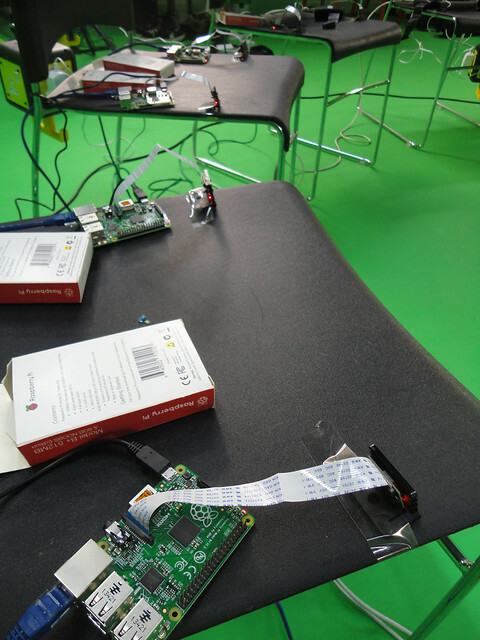 Initial development was carried out just on a single Raspberry Pi, once the image was successfully captured and transmitted it was then up-scaled to work with four Pi’s. 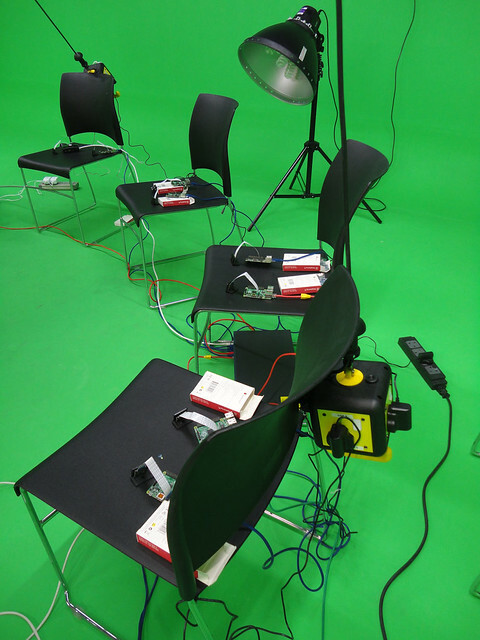 The next phase of testing was with around ten Pi’s, and all seemed to work well. 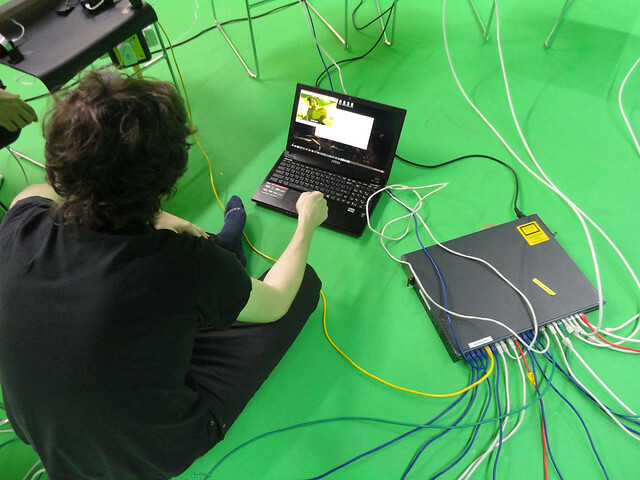 Some tweaking to the code was carried to speed up the capture / transfer process from the initial small scale tests. 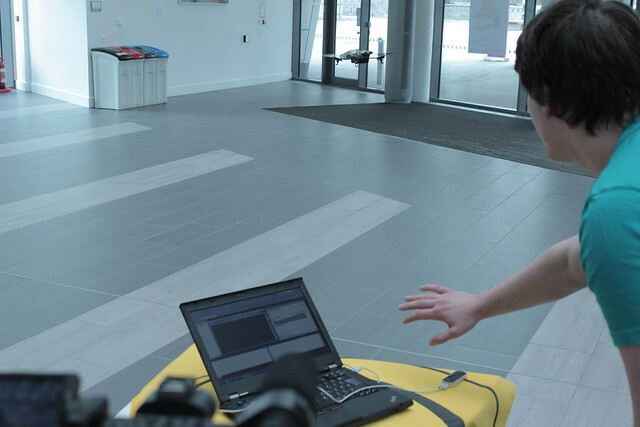 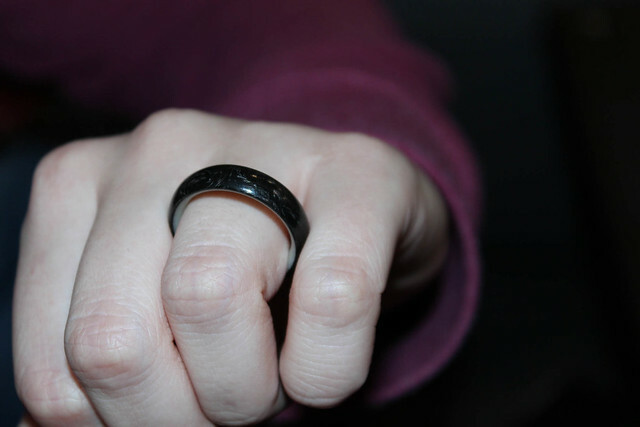 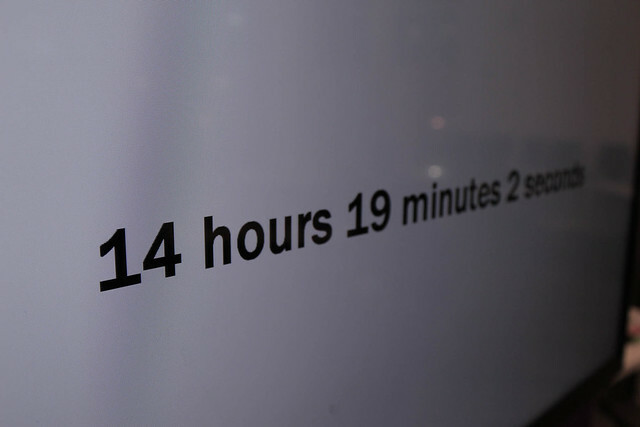 The afternoon of Wednesday 22nd April came the time to do a larger scale test of the system – with the submission date for the coursework just a few days away. 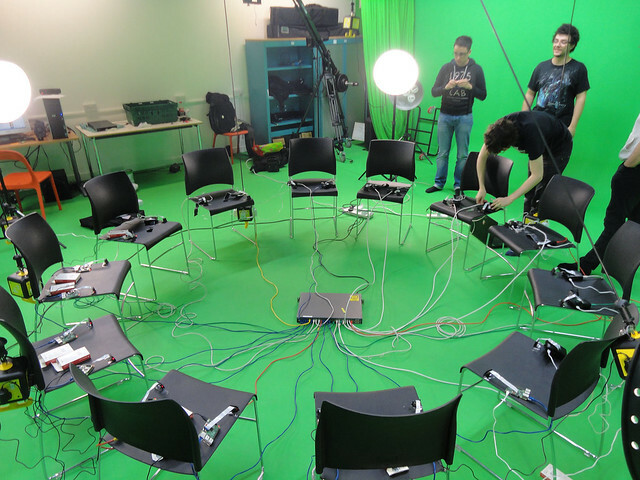 Hence 24 Raspberry Pi’s were gathered together and configured for a larger scale test, as you see here. 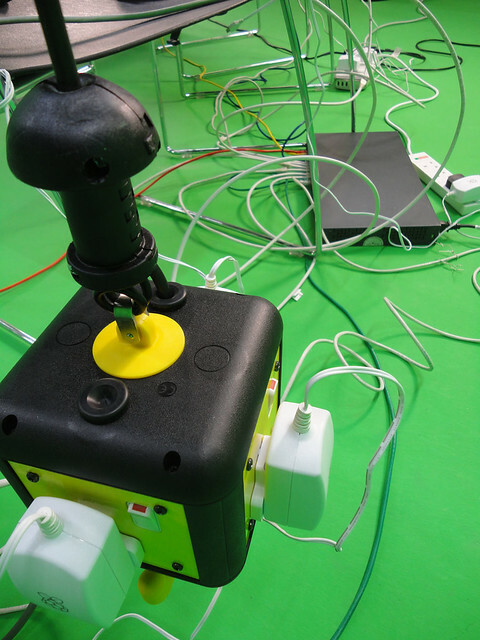 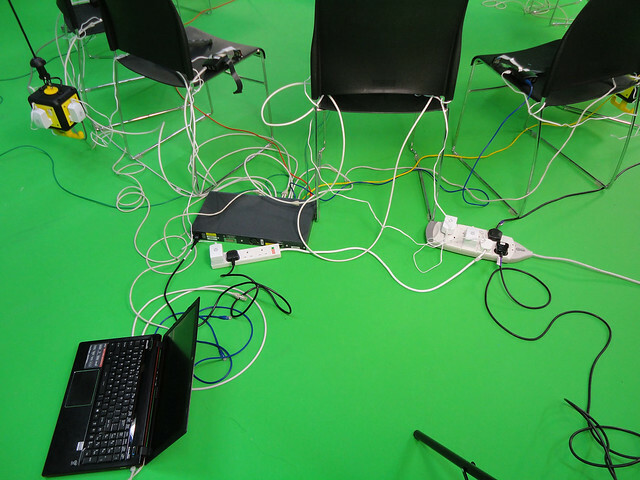 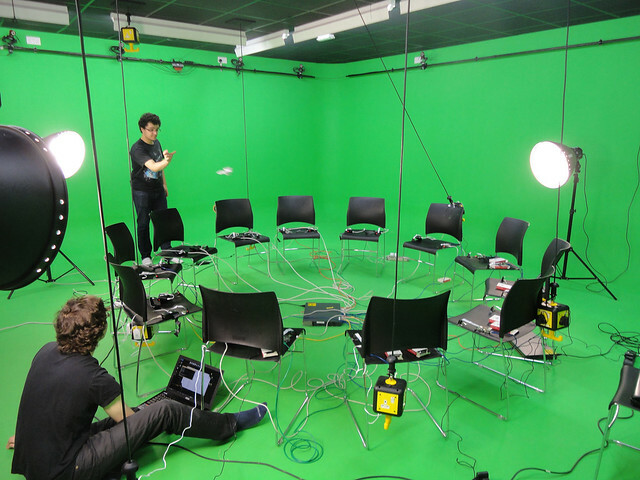 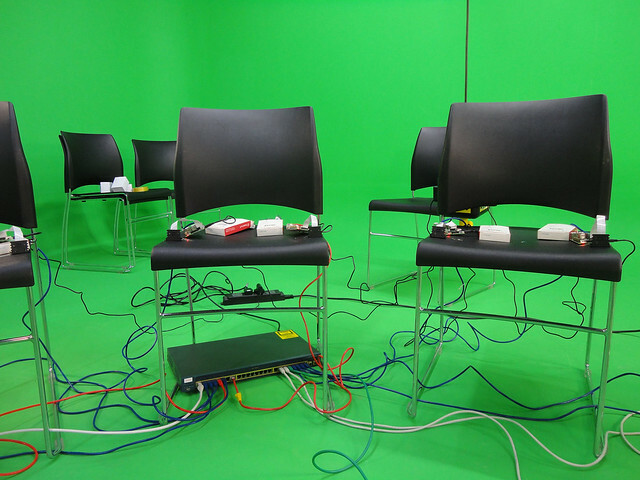 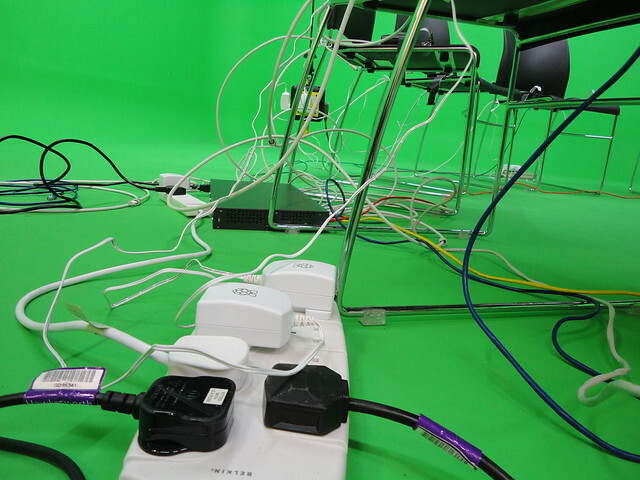 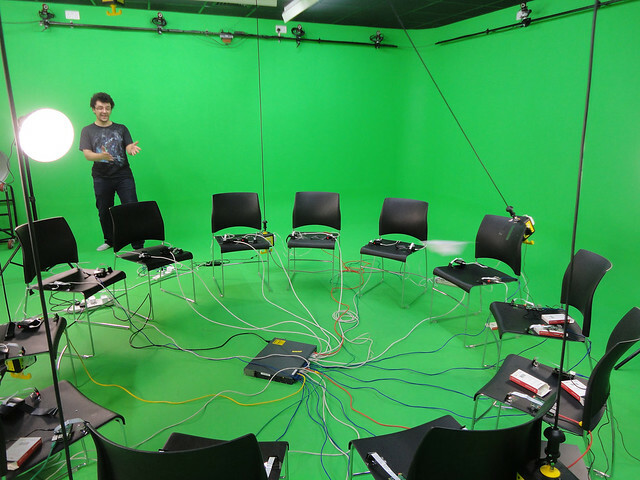 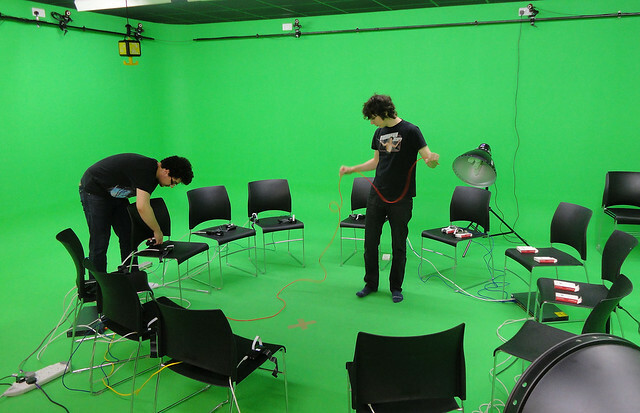 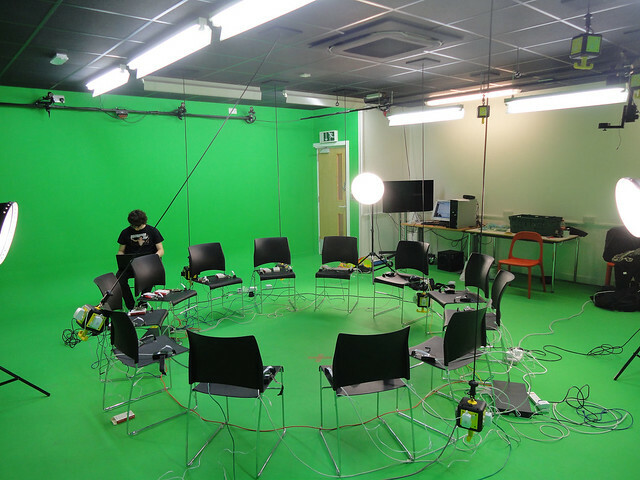 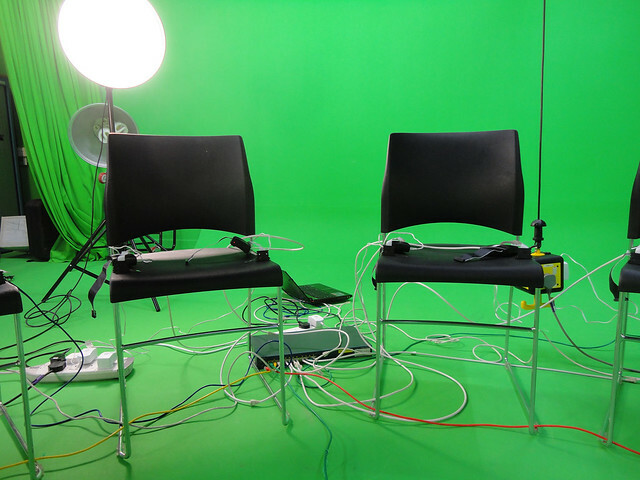 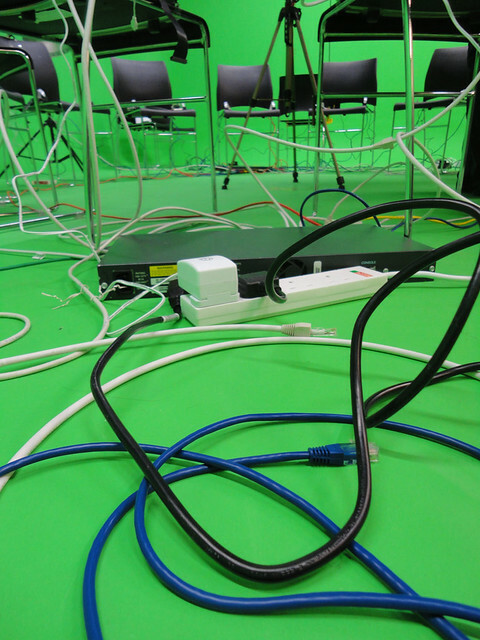 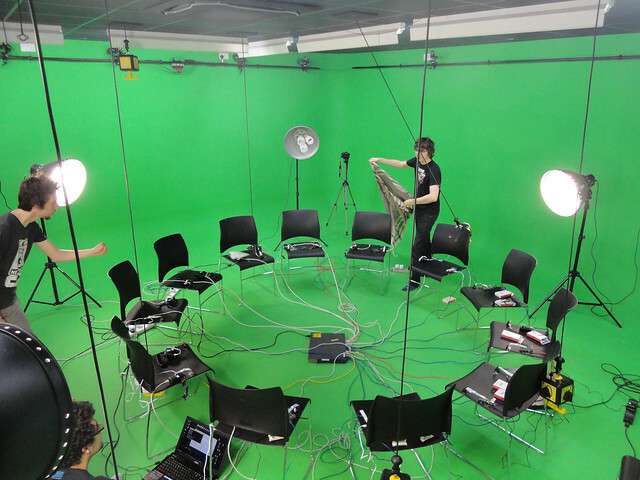 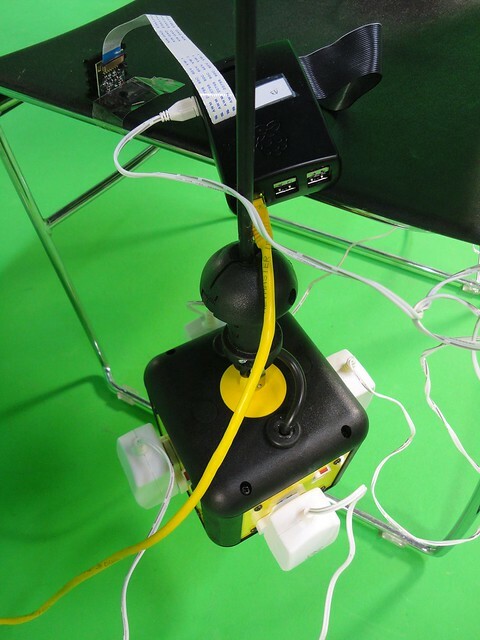 To allow space and plenty of power sockets to get the system running the 24 Camera Raspberry Pi – Bullet Time system was setup in our Green Room / Motion Capture Room. 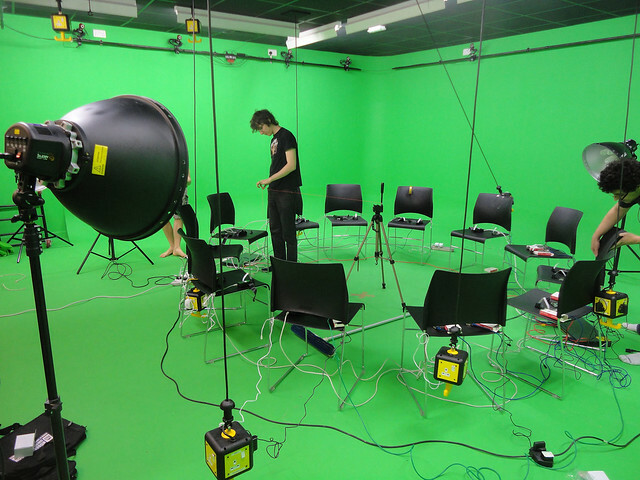 The following images run in reverse chronological order, firstly show the Bullet Time Rig in use, and works back to setting things up. 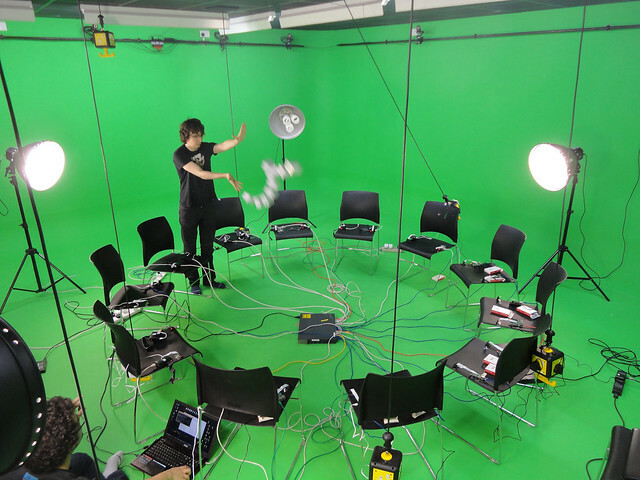 The very first capture test conducted was flying a paper plane through the capture space. 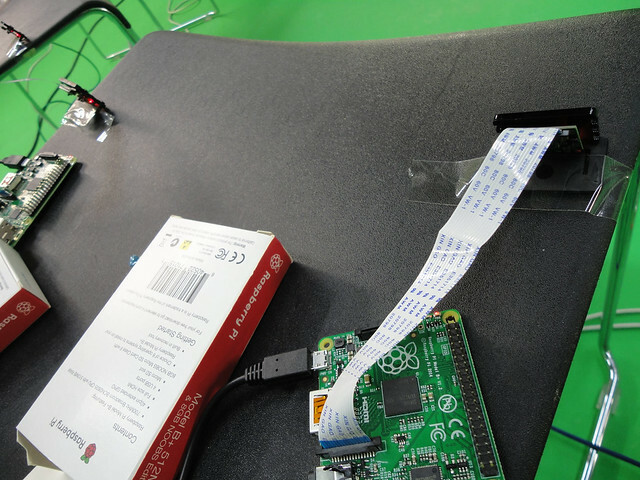 Followed by tossing ten empty power supply boxes for the Raspberry Pi’s into the capture space along with a few other ideas too. 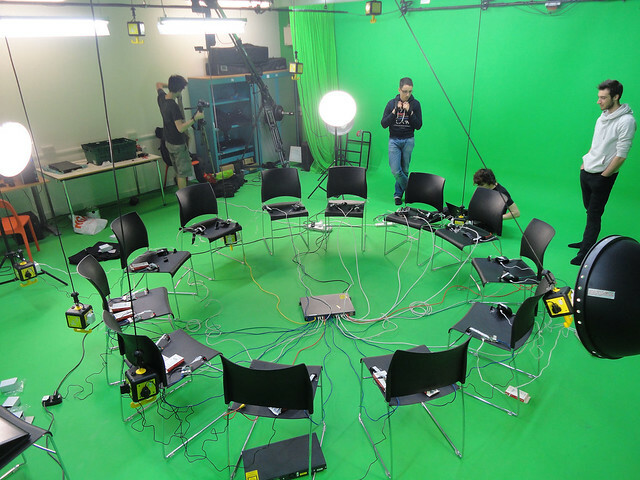 Would be really great to try building a larger size version of the rig as the software is capturing from all 24 cameras and transferring to the Computer in just a few seconds. 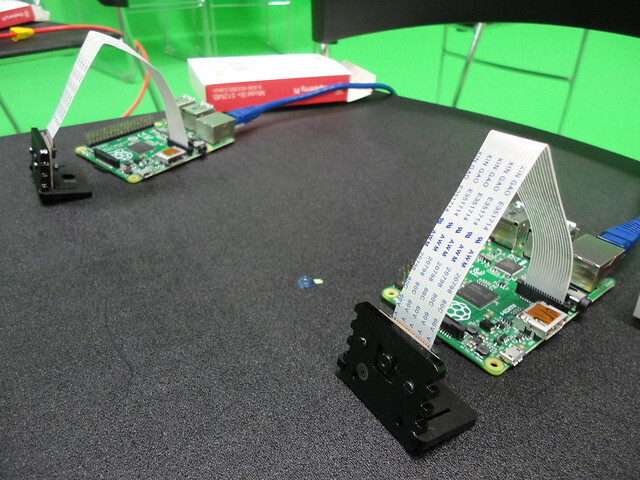 Perhaps something on the order of 75 cameras or more mounted on a laser cut stand with some 3D printed elements to secure the cameras and Raspberry Pi’s in place would be ideal with a diameter of around six meters. 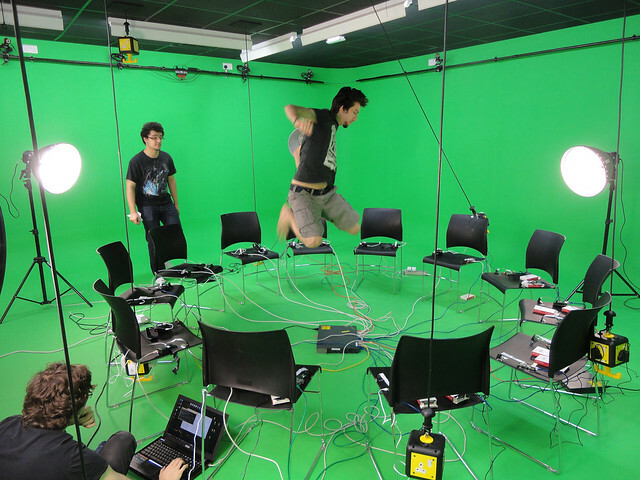 Such a rig should provide a good opportunity for capturing some really interesting shots. 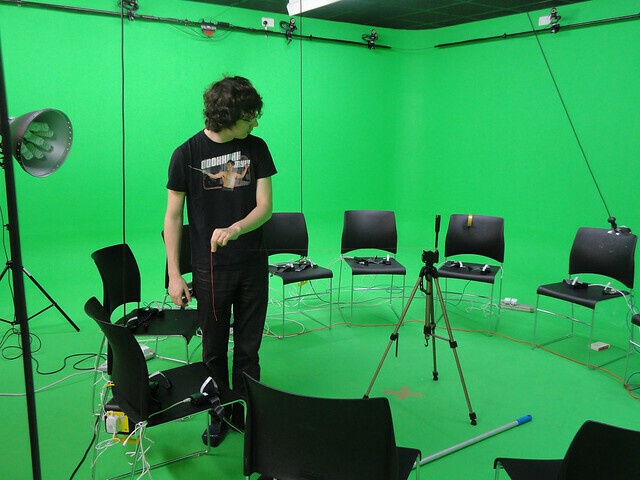 Its likely that the software developed will be placed on GitHub fairly soon, and may have another post or two showing some of the actual generated output. 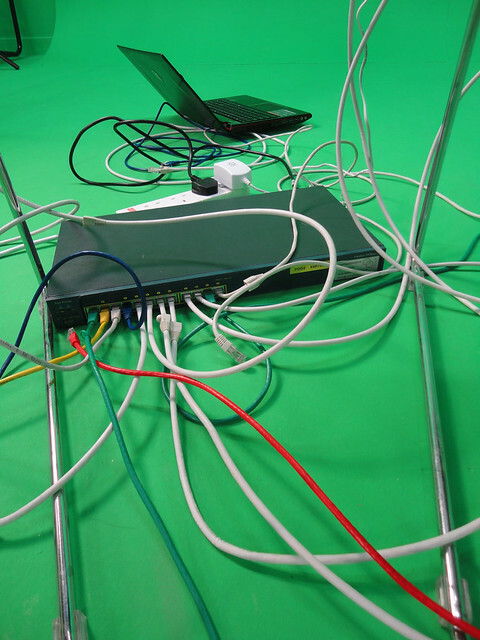 All one needs to build this rig is some Cameras, Raspberry Pi’s, network cables, a switch and the software. 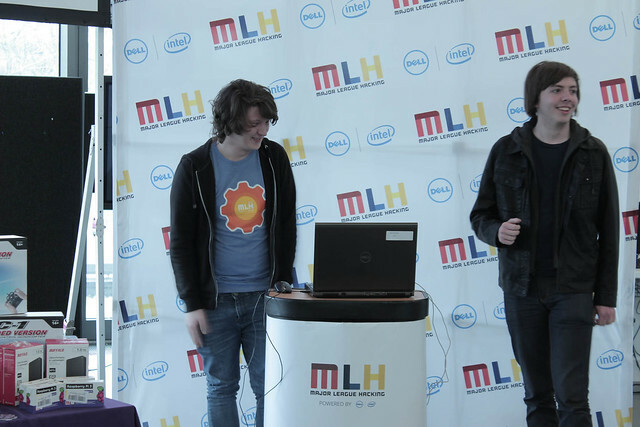 Reviewing one of the very first video files generated by the system. 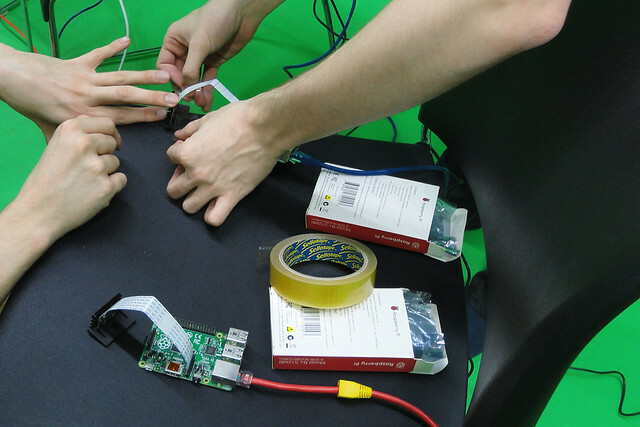 Checking that the Pi’s were connected up and in communication. 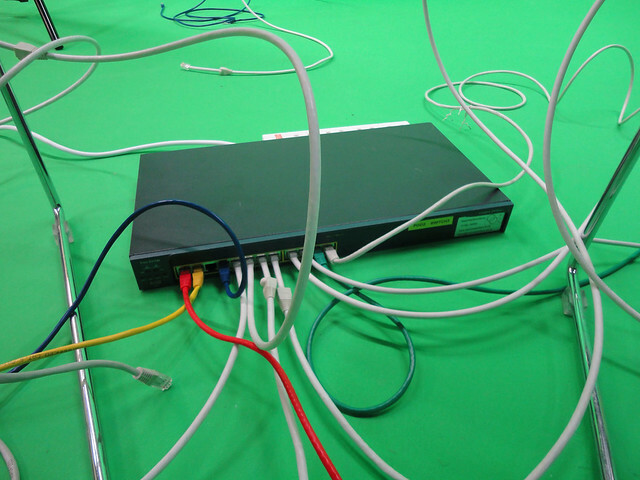 Making use of a 48 port switch to get things going. 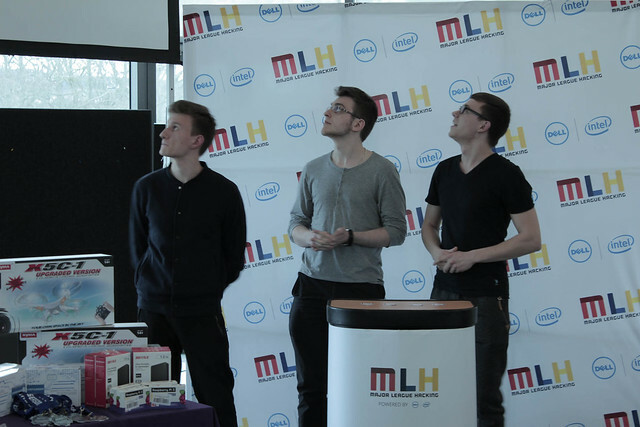 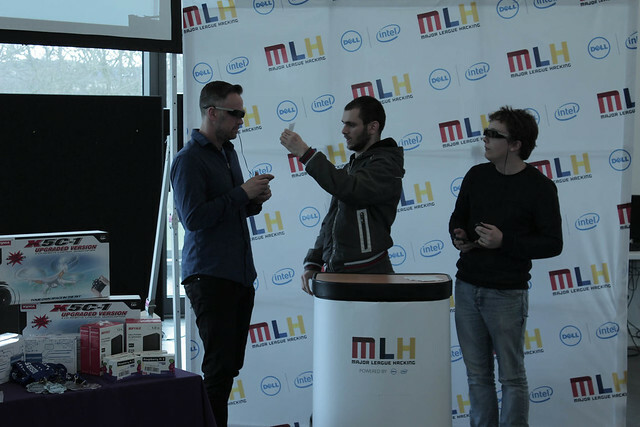 We had some visitors too, who popped by to take a look at the setup. 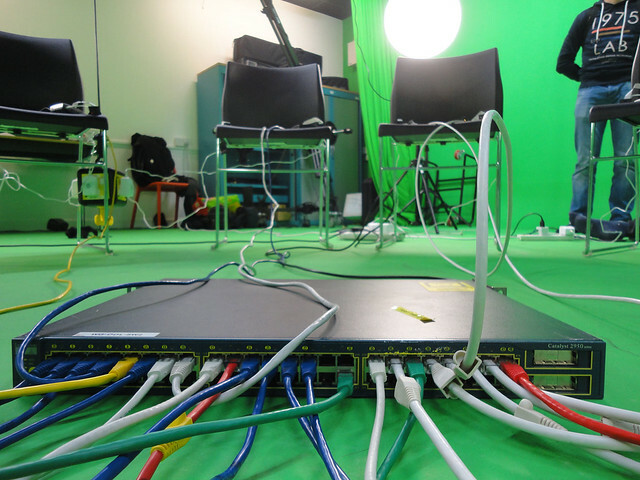 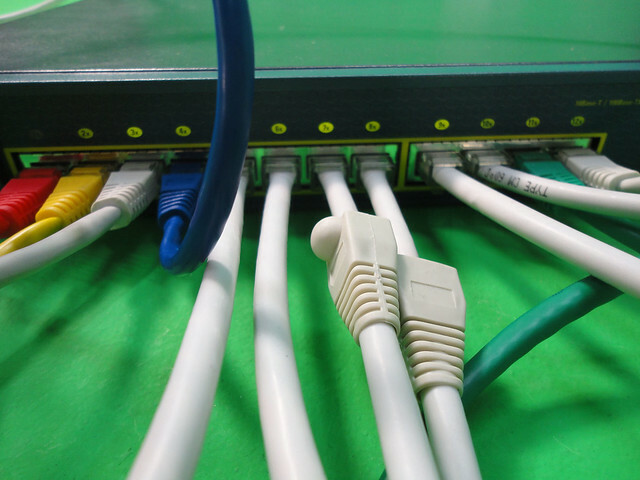 Initially the system was setup to make use of two 24 port switches, though with the choice of having to do some switch reconfiguration or just using a larger switch, the 48 port switch option was taken, and perhaps made for a more interesting cable layout scheme! 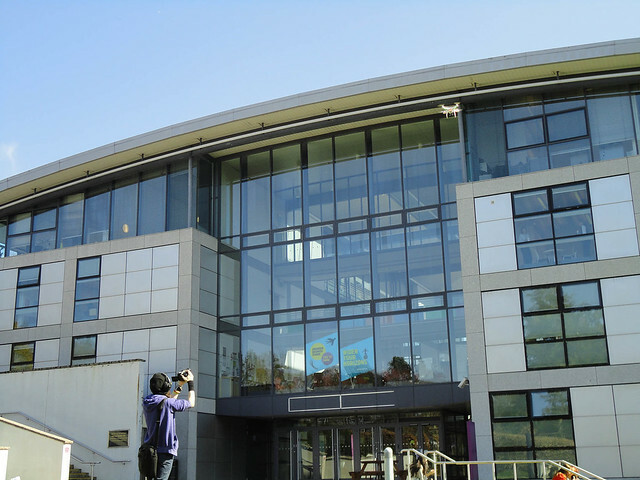 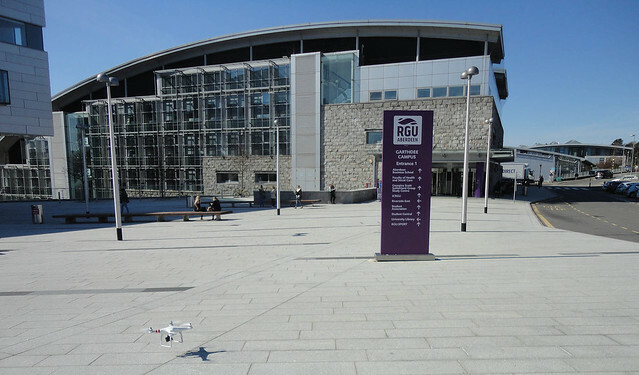 As I was dropping some gear back to our support team yesterday morning after the weekends RGU Hackathon, they queried if I would be able to assist some of my students with their coursework for a module I teach titled “Interactive Multimedia” – their task being to research, design, develop a presentation, video and interactive and tutorial on how to setup and fly a Quadcopter. 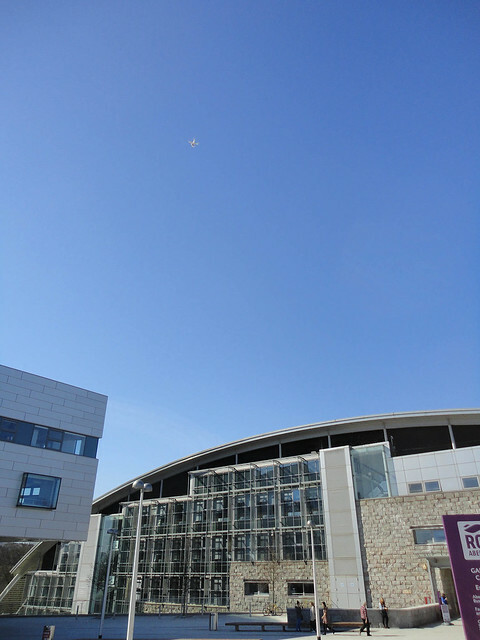 Generally we require our students to get a good few training sessions before being left to fly the Quadcopters all by themselves. 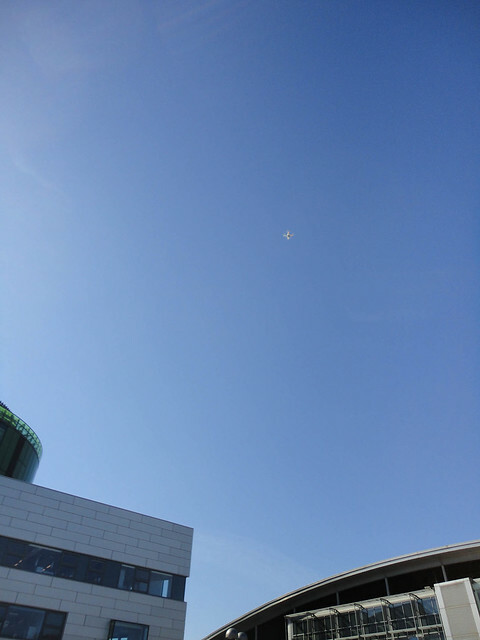 Given it was such a lovely morning with clear blue skies and no wind, it was absolutely perfect conditions for some Quadcoptering. 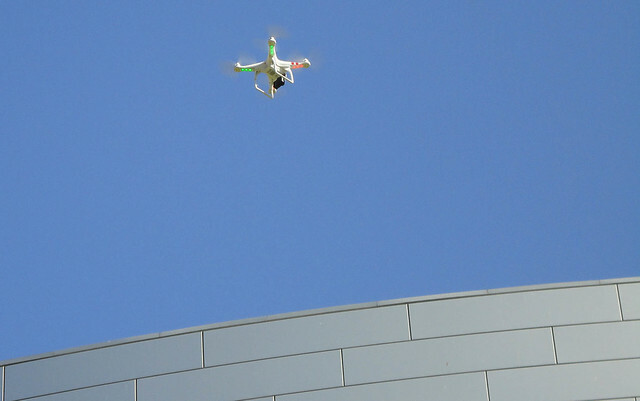 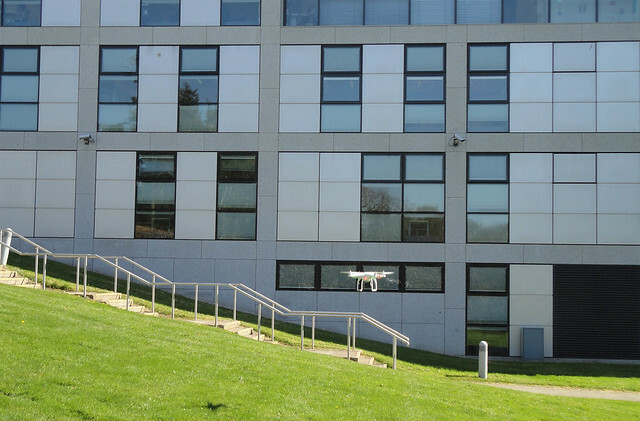 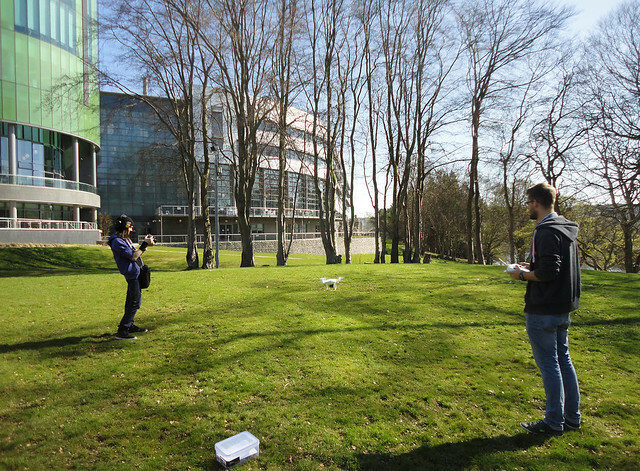 So we grabbed one of the Schools DJI Phantom Quadcopters, some batteries and went out to a few locations around campus to grab some footage of the Quadcopter setup and operation. 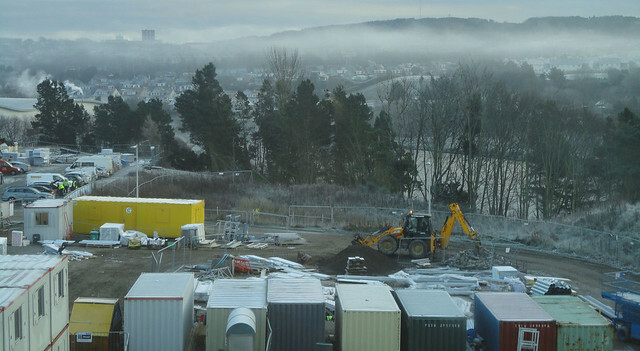 The following images below should give you some idea of the morning we had. 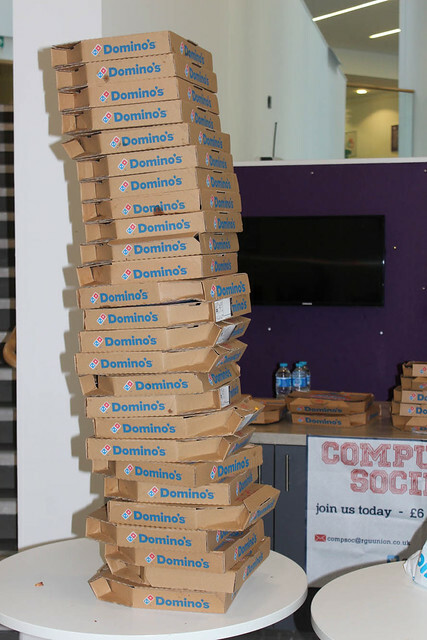 I must say that all the landings were perfectly executed. 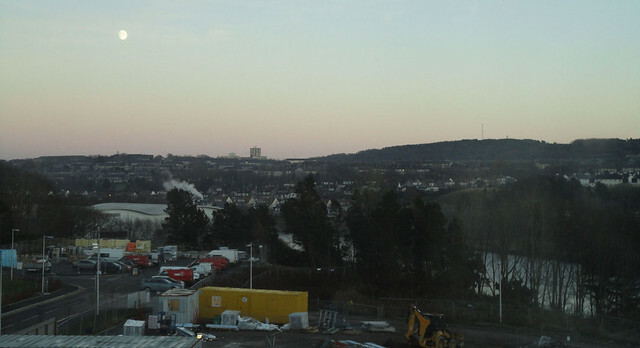 Was a great morning to be outside too, rather than stuck in front of a computer screen and keyboard.